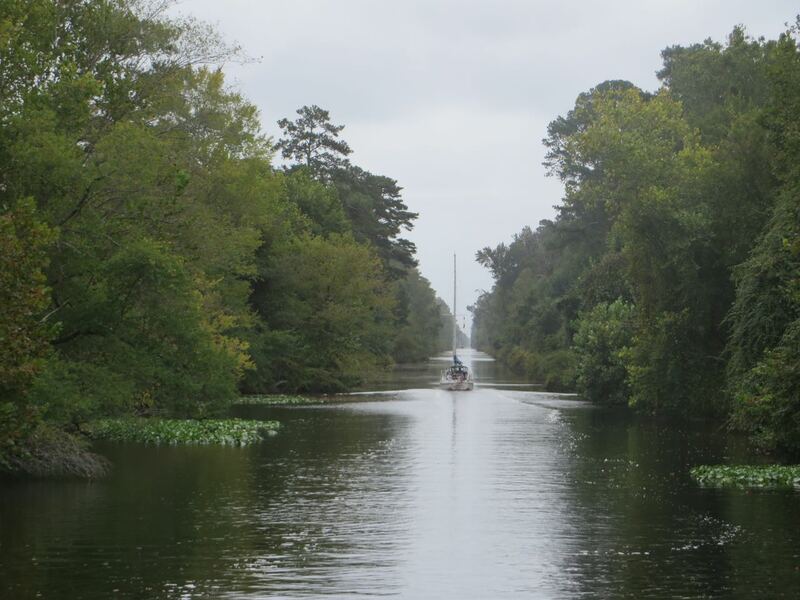 I still remember when I first heard of the Dismal Swamp Canal as part of the route we must take down the ICW. It sounded, dark and deep and, well, a little scary. 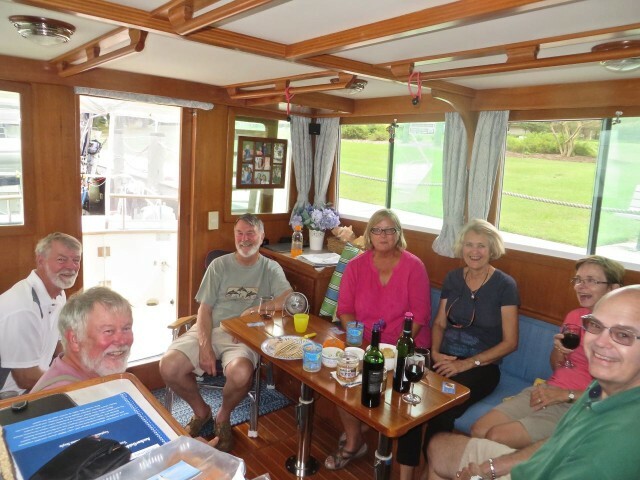 In 2013 we were ready to give it a go and head towards it from Portsmouth with our sailing buddies on Magnolia, Anthony and Annette. 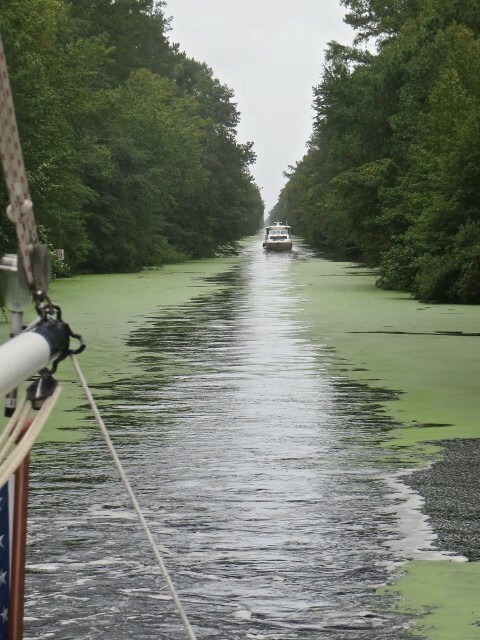 (“Dismal Swamp Canal = NO…..Virginia Cut = YES“) Just as we “turned the corner” into the canal, we were warned on the VHF to turn back due to the thick choking duckweed that was covering the water. We did, and took the “Virginia Cut”, an alternate route. Here we are in 2015, and we really wanted to “do the Dismal.” It’s not just the duckweed that scares boaters away from the Dismal; it’s also the shallow depth (“maintained at a six foot mean depth”) and sunken logs beneath the surface. 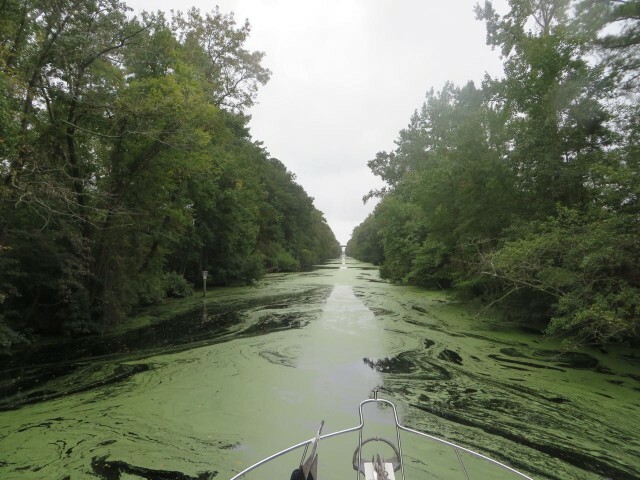 We personally know cruisers who have had significant damage done to their keels or have overheated due to duckweed in the engine system. But…. we are a trawler now with only a 4.5 foot draft which makes the average 6 foot depth of the canal less of a concern. I called ahead to the first lock tender to check the conditions before we set out. 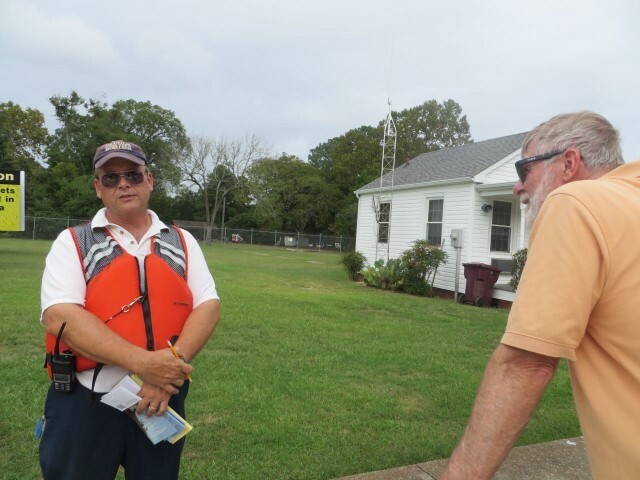 He assured me that we would be fine if we had a skeg protecting our prop and if we only kept the speed to 5 knots. No problem. We hoped! Another early start to the day, leaving Sunset Creek. We crossed Hampton Roads (a large busy anchorage bay, not a land road) over to Norfolk and Portsmouth through the bustling navy yards. The naval ships were up and about in the early morning and so were the dolphins. I took photos but thanks to the overcast and cloudy day, everything really was a battleship gray color. Here is the big moment – At red can #36 just past Hospital Point anchorage in Portsmouth, we officially entered the Intracostal Waterway, the ICW. Red can #36 = ICW Mile Marker “0”. Don’t you think they should hang a sign on it?? 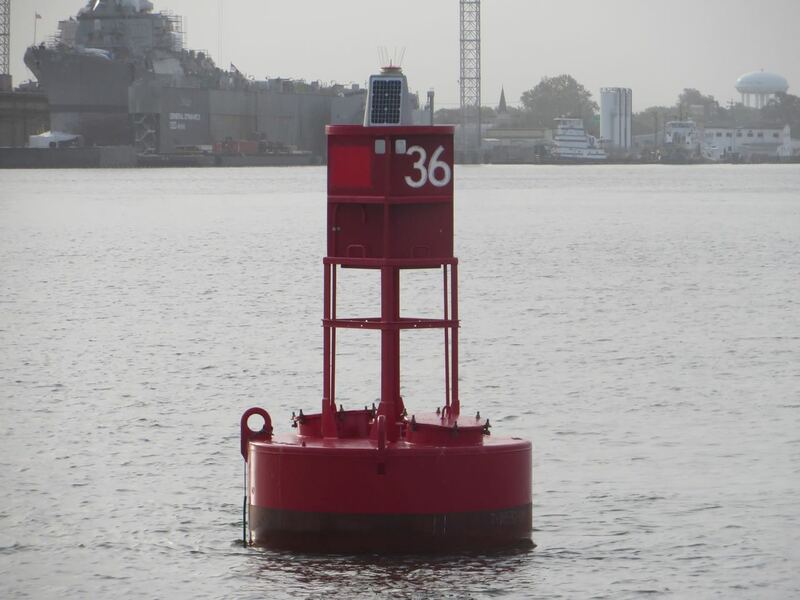 Red can #36 = ICW Mile Marker “0”. Don’t you think they should hang a sign on it?? It’s bridge time! 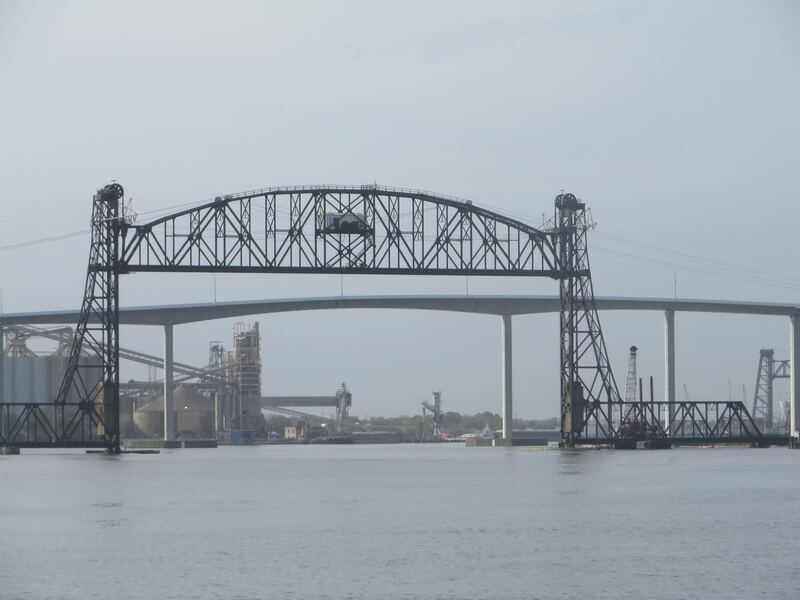 – first a low railroad bridge that is kept open (unless a train comes by) and then the high highway bridge shorty after. The Puffin Bulker, a “bulk carrier” was in dock. What a caught our eye was the escape pod. It reminded us of the movie we had seen at the Commodore Theater in Portsmouth on our last passage through here Captain Philips. Just reminiscing. 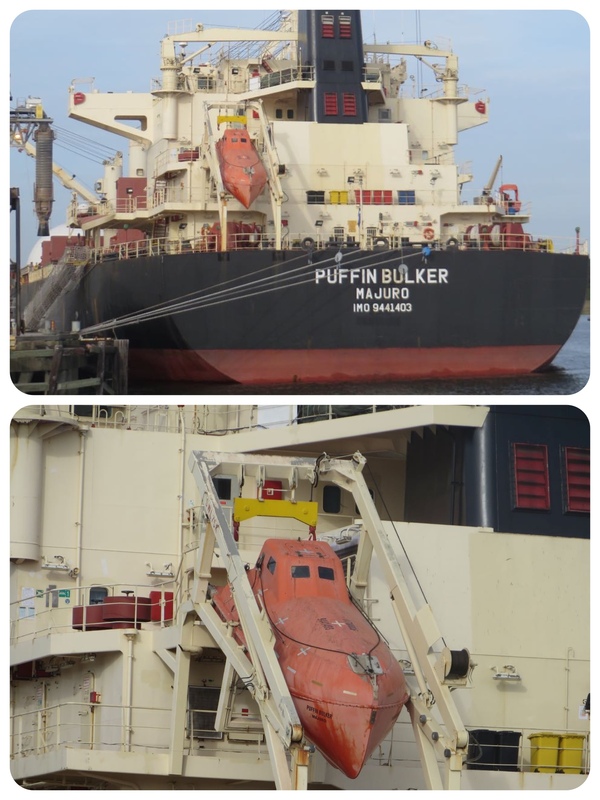 Puffin Bolker and its escape pod – remind you of the movie “Captain Philips”? The new Gilmerton Bridge is now operating. 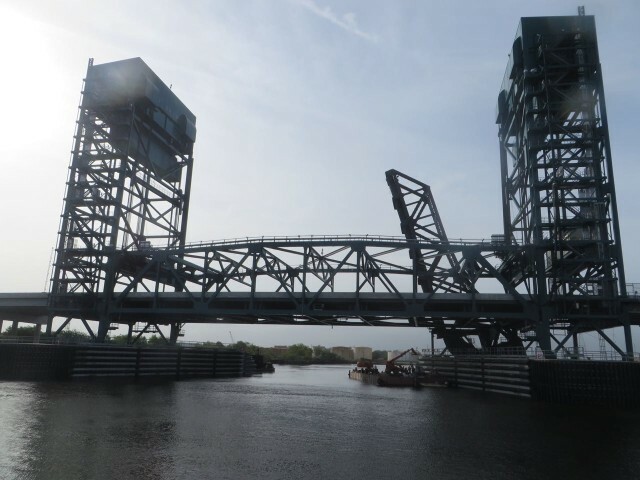 Once a bascule bridge, it is now a lift bridge. The good news for us was that its new height was 35 feet when closed – we would not have to wait for it to open. 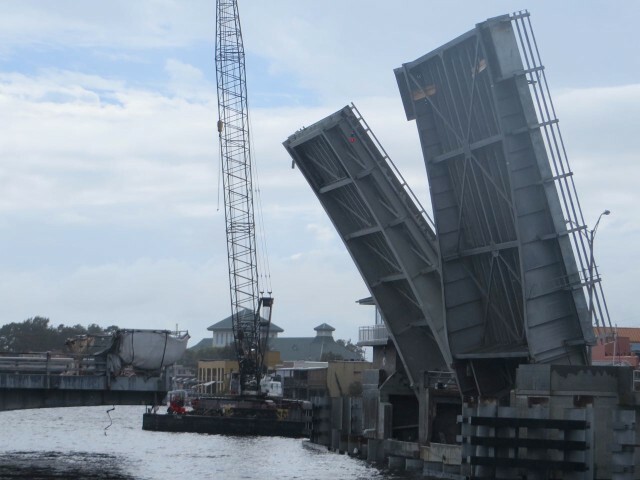 The new 35 foot Gilmerton Bridge – we can pass under it and not wait around for an opening! Do the Dismal! This time we will! The name itself is intimidating, conjuring something that is dark, dreary, and forbidden. Early settlers called swamps, “dismals” hence the name. Although that would seem to be redundant, wouldn’t it? It is the oldest continually operating man-made canal in the United States. 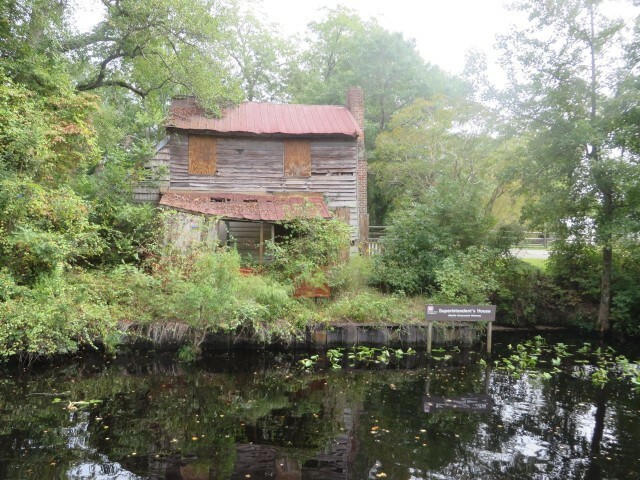 In 1784, the Dismal Swamp Canal Company was created, but work did not begin until 1793. The canal was dug completely by hand and must have been excruciating for the slaves who were hired from nearby landowners. 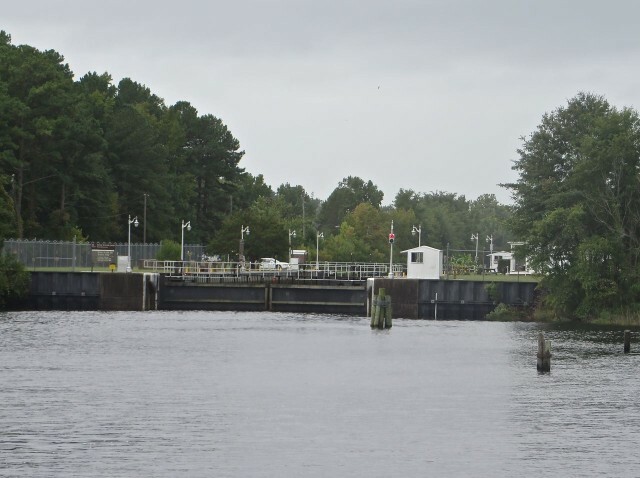 It took approximately 12 years of construction under mostly unfavorable conditions to complete the 22-mile long waterway, which then opened in 1805. The Canal is on the National Register of Historic Places as a Historic Landmark, noted as a National Historic Civil Engineering Landmark, and has received the National Underground Railroad Network to Freedom Designation. We make the turn and already we are farther into the canal than on our first trip. We reached the first lock, Deep Creek Lock, in short time as it is 3 miles after you enter the Dismal. 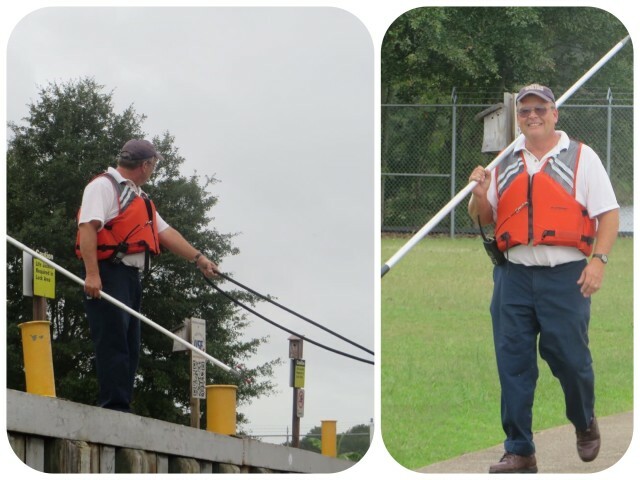 Deep Creek Lock is famous for its gregarious lock tender, Robert Peek. I had read that he was retiring in October so we were looking forward to meeting him and experiencing this lock before his retirement. When the red light is showing, the lock is not open yet. 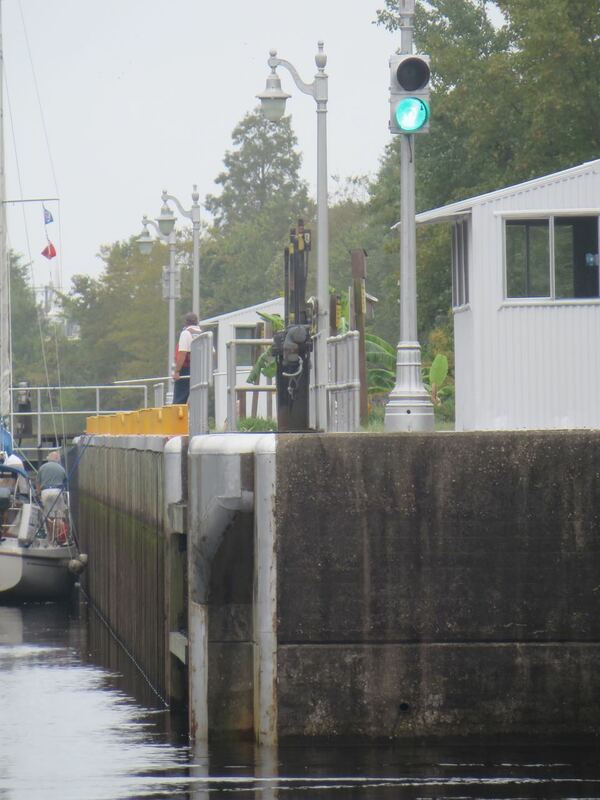 We have the green light so we enter the lock after the sailboat. Notice how low the water is. Here is Robert Peek doing his locking thing. This is a man who loves his job! As we wait, tied to the big wall, I wrote our name and date on the wall. 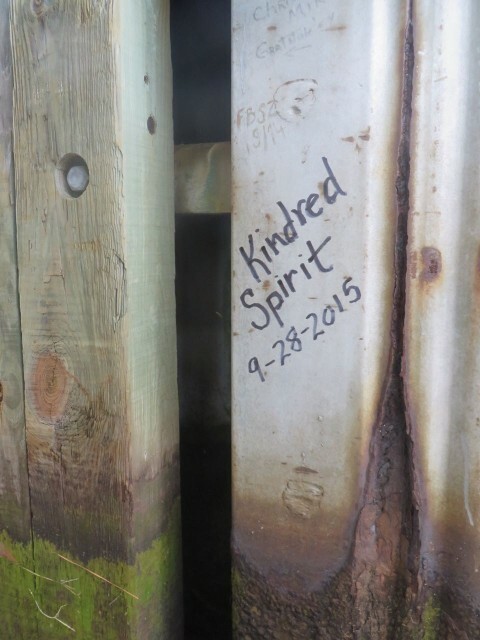 Evidently that is a tradition, so Kindred Spirit joined the names of other boats who have passed through. An Intracoastal mileage sign posted at the lock. Hmm. looks like we have a long way to go. 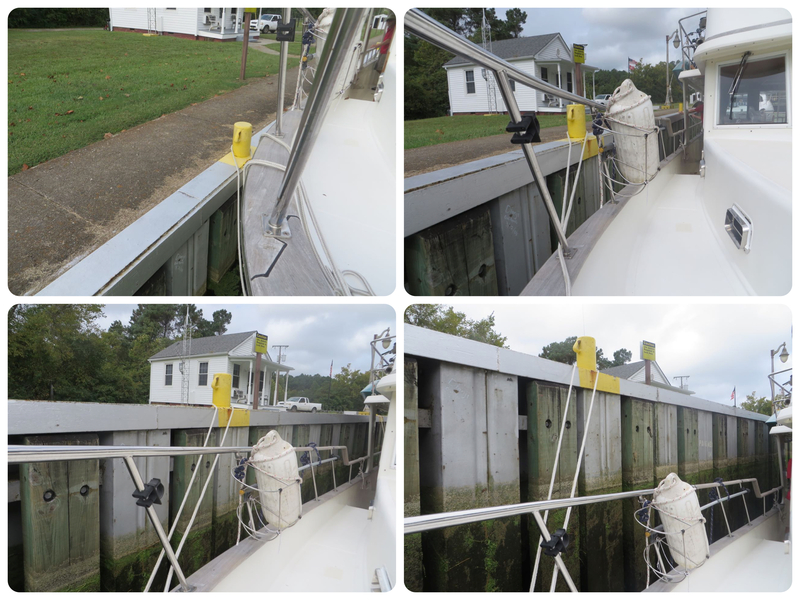 After the four boats were in the lock, the water fills it and lifts us all up higher to the level of the water int he canal on the other side. Robert and Al are chatting. Robert loves to talk and share. Robert Peet is known for his conch horn blowing. As soon as he heard we were headed to the Bahamas, he asked us to bring him a conch shell back on our return trip. He needed a new one. Robert has a LOT of conchs around the garden in front of his office. He took the time to demonstrate his conch horn blowing skill with one of our conchs. Robert told us he has changed his mind about retiring and will be here in the spring on our return trip. Told us to pull over to the dock on our passage north and have coffee with him in the morning. Probably says that to everyone, but it was a nice chat and visit. I do wonder if the other boats in the lock were getting anxious to get on with things. Just a half mile down the canal is a little bridge that has to open. Robert, as lock tender, does the lock and then drives to the bridge and opens it for the boats. I took quite a few photos but this one captures the view as we followed this sailboat. Our speed ranged from 4.5 – 5 knots most of the way. Slow and steady. 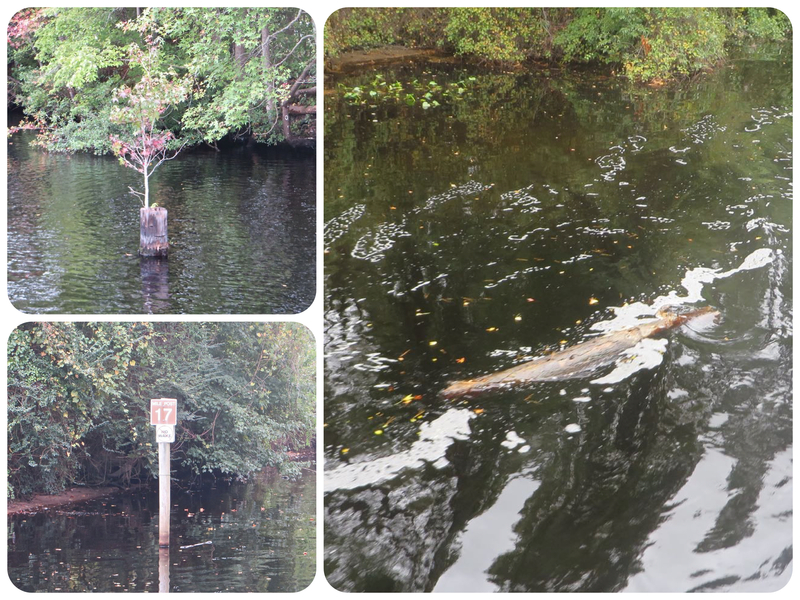 Most of the old pilings left along the sides now have trees sprouting from their tops. 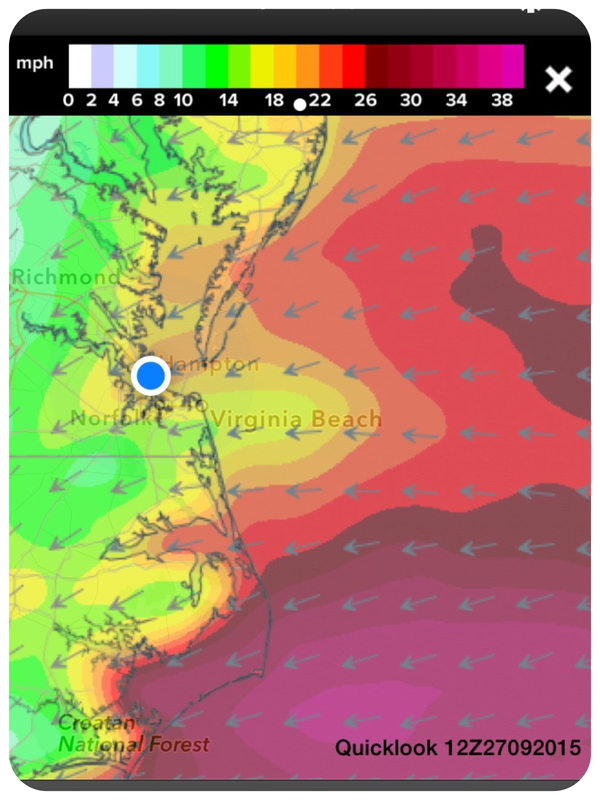 A dreaded deadhead floats by – don’t want to hit that! Mile Marker #17, same as our house number at home. 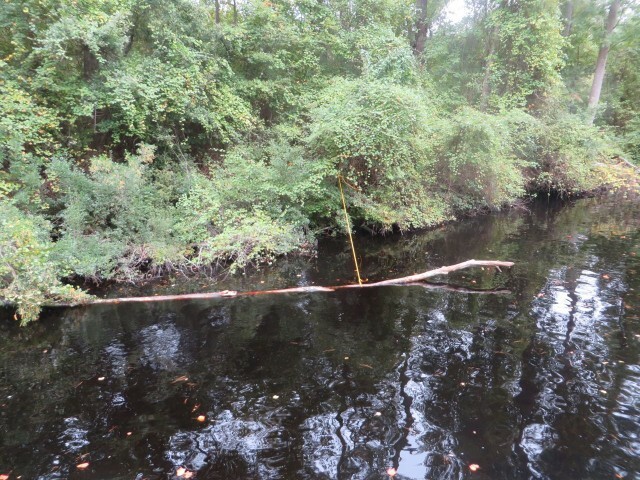 We saw some fallen trees tied off to the side with yellow line so that they don’t drift out farther. We crossed a state line! We are in North Carolina now. “The Superintendents House”. No other explanation available. What do you think Dr. B? 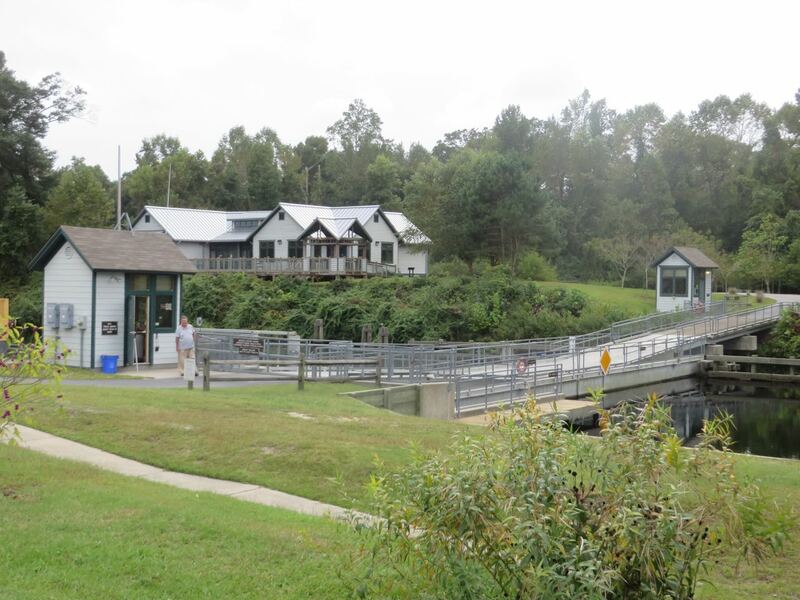 The Dismal Swamp Canal Welcome Center is about 18 miles south of Deep Creek Lock and is a “rest stop” for both the highway and the waterway – very unique! 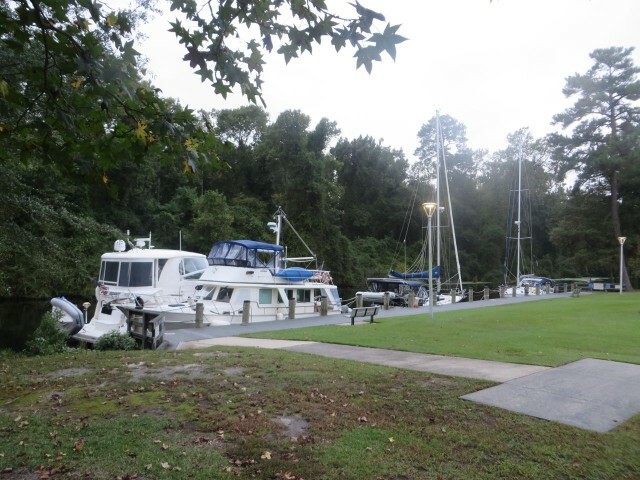 The Welcome Center also has a 150 foot long dock for boats, for free. 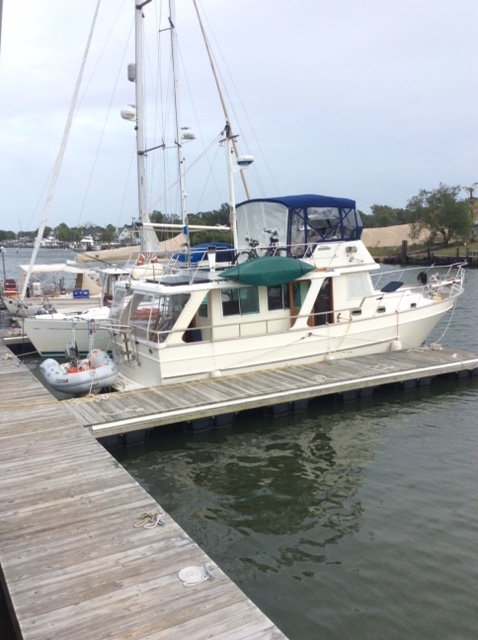 During the busy migration season there can boats rafted to each other 3-4 deep along the dock. 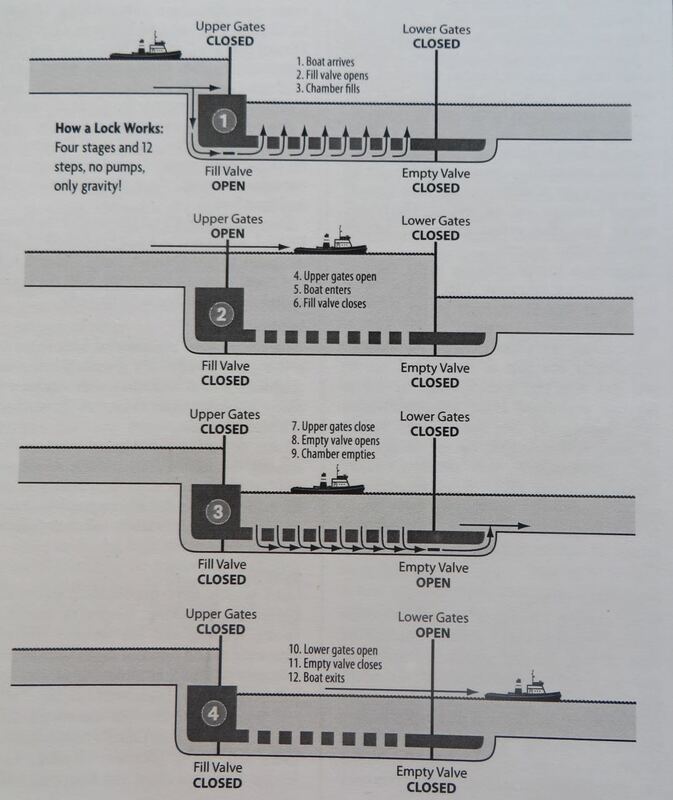 Seems to us that the whole canal would be blocked if that happened. 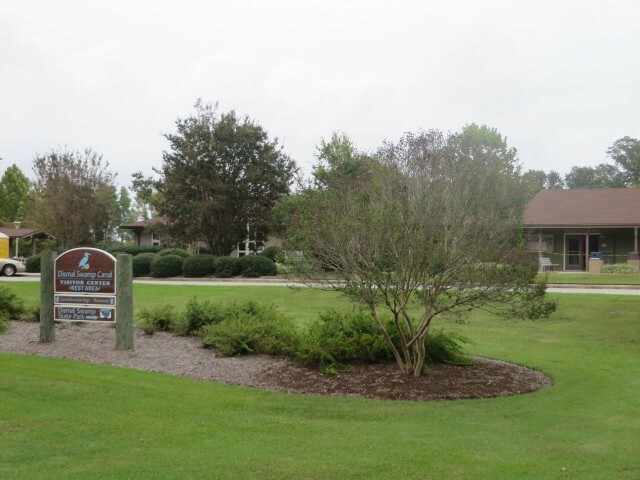 The grounds of the Dismal Swamp Welcome Center. They have a nice little office and gift shop, and very helpful staff. You can walk across the pedestrian pontoon bridge to the State Park visitor’s center on the opposite side to learn more about the Dismal Swamp. Kindred Spirit and Spindrift together at the dock. Spindrift was a boat from Branford, Connecticut. And then there were four boats at the dock. 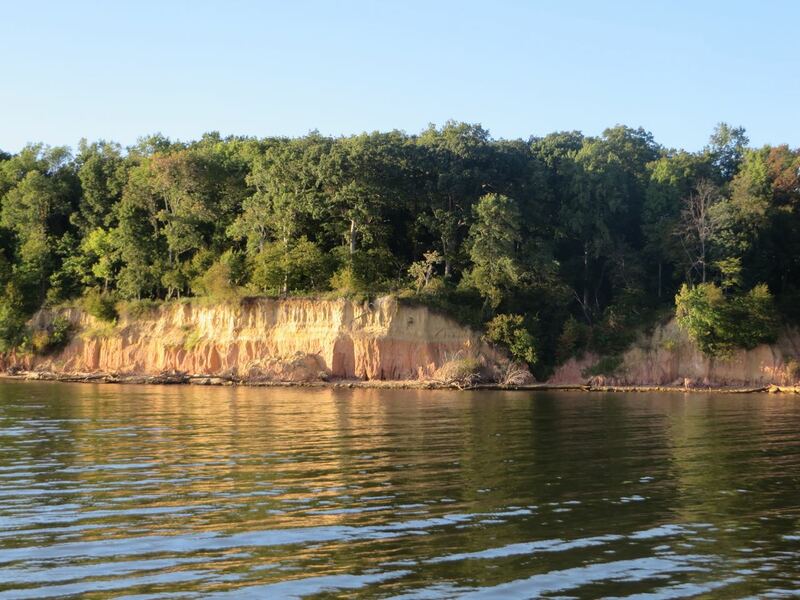 We heard that in the busiest traveling days, there can be 20 boats there, rafted 3-4 deep. 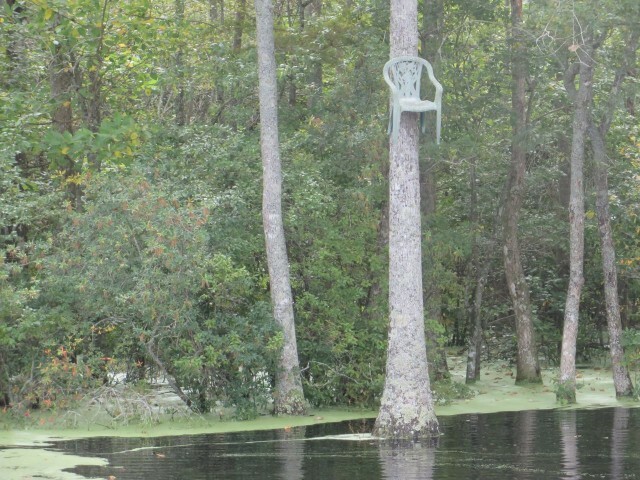 Can’t help but wonder if any boat could pass by? But then, at that point maybe everyone is staying there anyway? 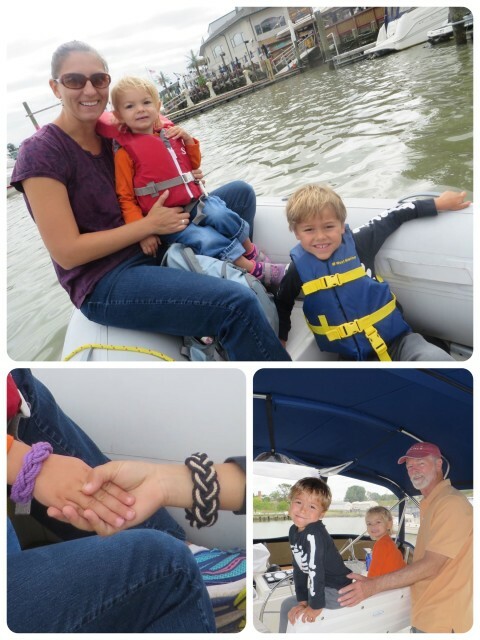 We followed the tradition of dockside camaraderie and hosted happy hour on our boat. New friends! 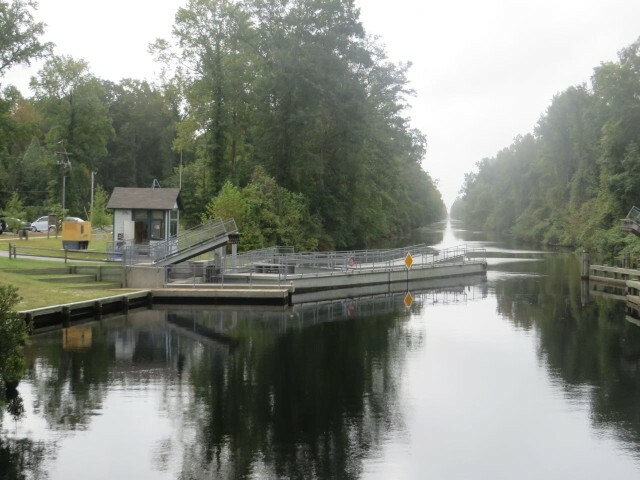 Day 2 on the Dismal Swamp Canal began with the opening of the little pedestrian bridge. 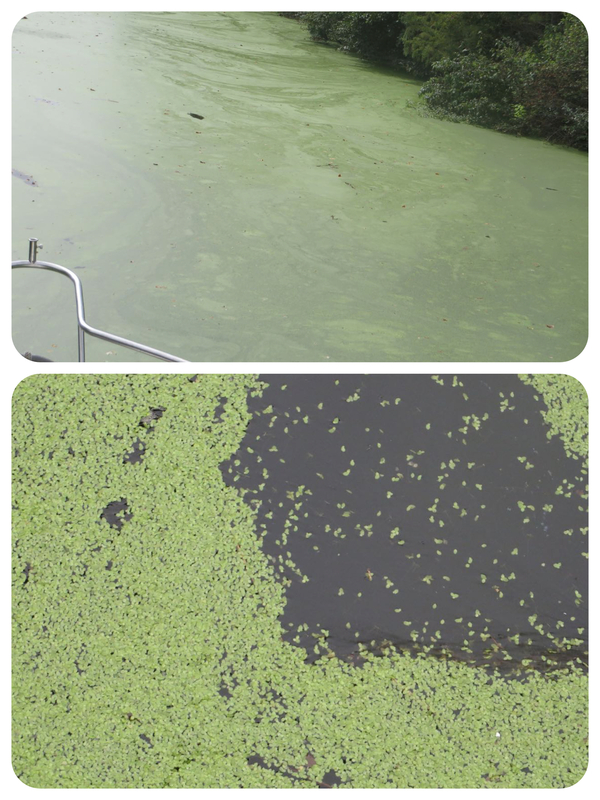 The second day though the canal brought the duckweed, but not to the levels that would choke our engine’s intake. It was just a light covering on the surface and did not extend downward to any depth. Duckweed swirls upon the water. Looking aft you can see the “path” we cut though the duckweed. Duckweed – up close and personal. The “carpet” is actually made up of tiny little leaves. 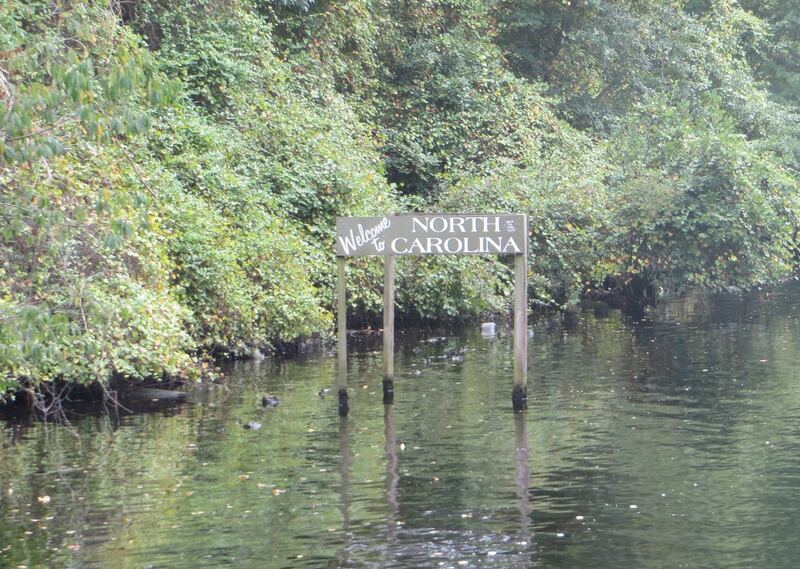 The water through southern Virginia and northern North Carolina is dark brown, like a strong tea or root beer. Tannin is naturally released from the roots and decaying leaves of the baldcypress and juniper trees that line the canal cuts. We had noticed this last time, but the water seemed to be deeper shade of brown here in the Dismal than it did in the Virginia Cut. The tannin doesn’t make the water “dirty”, but it does stain the fiberglass on boats giving them an “ICW moustache” along the waterline. This next picture is not what you think it is!! The toilet on this boat flushes with “outside” water which usually means salt water. Most boats do. 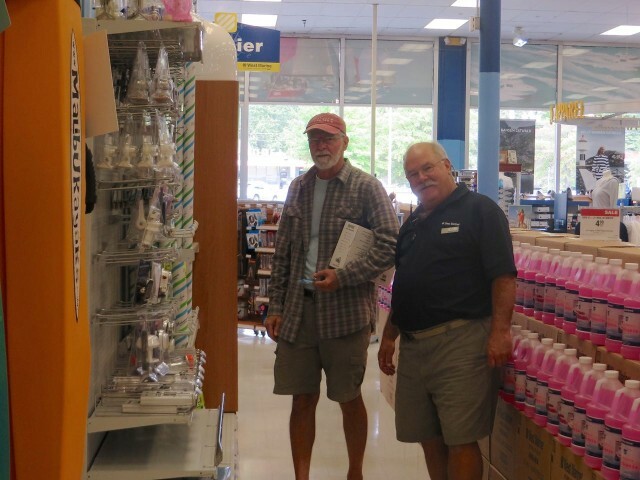 Kindred Spirit, the sailboat, had a fresh water flush system designed by Al. Therefore, we were caught off-guard by the tannin in the water when we flushed the toilet, to say the least. This is a very clean toilet even though it looks gross. 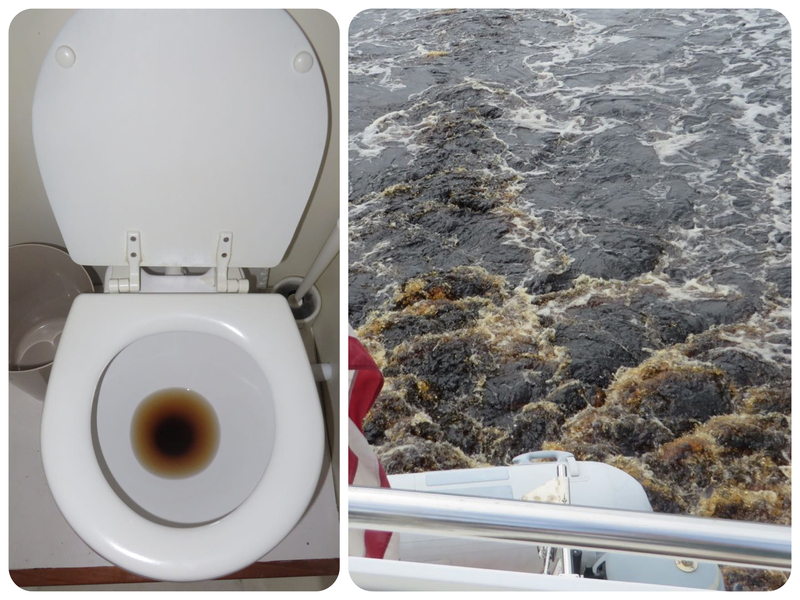 The left picture is of our wake, churning up the brown water. THIS IS NOT WHAT YOU THINK!!! South Mills Lock is the second lock in the canal, preceded by a bridge. 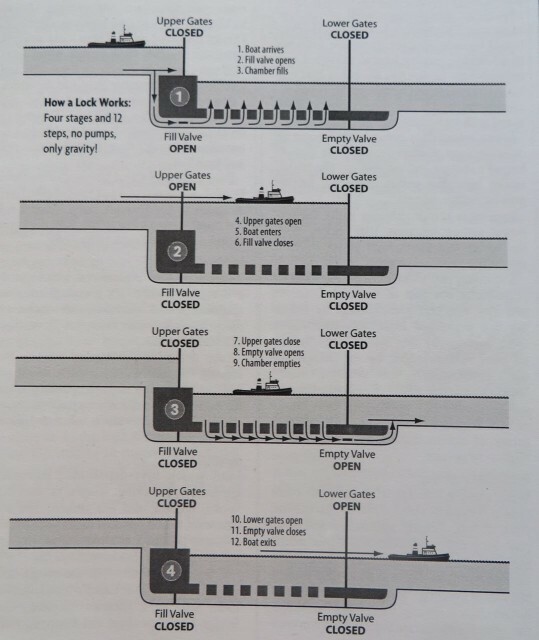 It is a lock that goes from high water to low water. 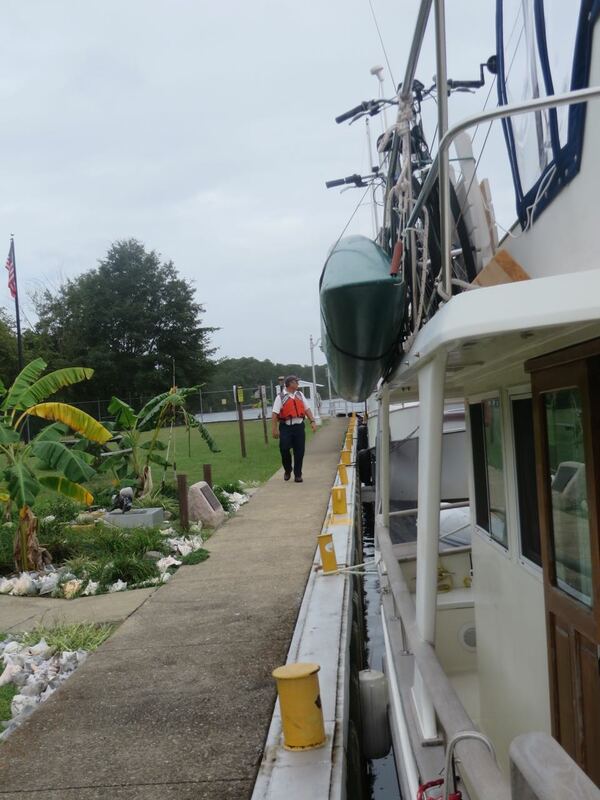 This time the boat starts outweigh and gradually drops lower as the water leaves the lock. And then there are sights that are just, well, just weird. What do you make of this? Any ideas? Any? The Dismal Swamp is home to one of the largest Black Bear populations on the East Coast, subtropical birds, butterflies, bobcats and white-tailed deer, so the Visitor Center said. The Dismal Swamp is home to one of the largest Black Bear populations on the East Coast, subtropical birds, butterflies, bobcats and white-tailed deer, so the Visitor Center said, but all we saw were these cute turtles on a log. 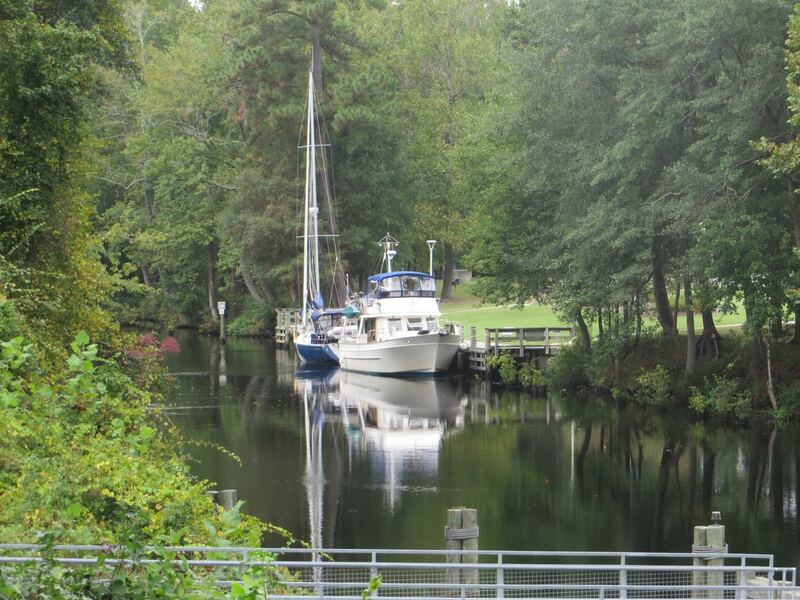 The Dismal Swamp Canal brings you to Elizabeth City, passing under a bridge to arrive there. This bridge is also under construction. It was a little confusing to see two right sides up, but nothing on the left. 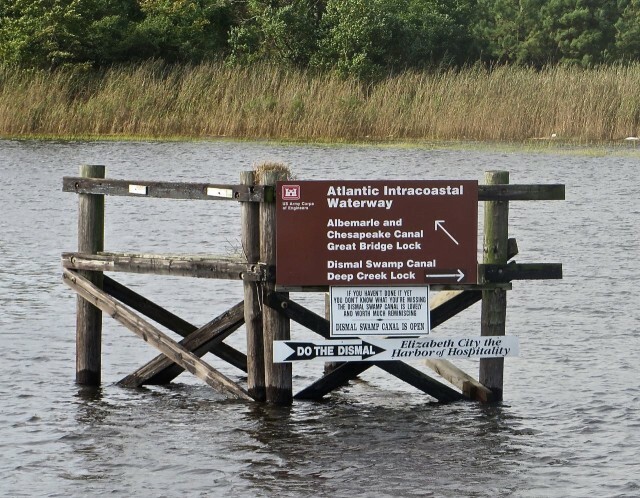 We had planned to stay the night in Elizabeth City at their free municipal docks, but our plans changed based on the weather forecast for later in the week (I’ll save that for another blog.) 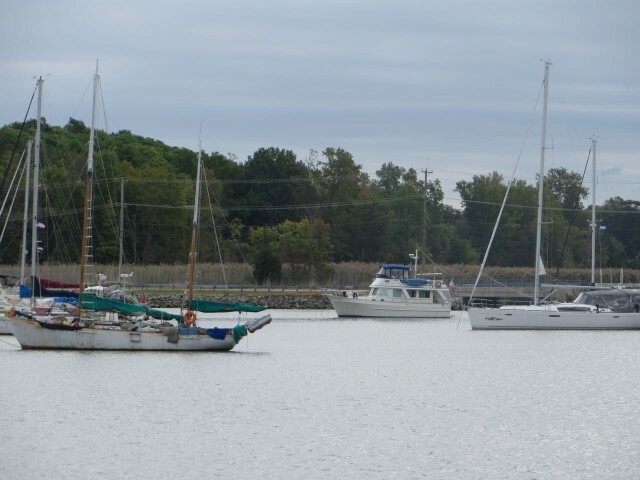 Elizabeth City is known for its hospitality to cruising boats and provides free dockage at Mariners Wharf. 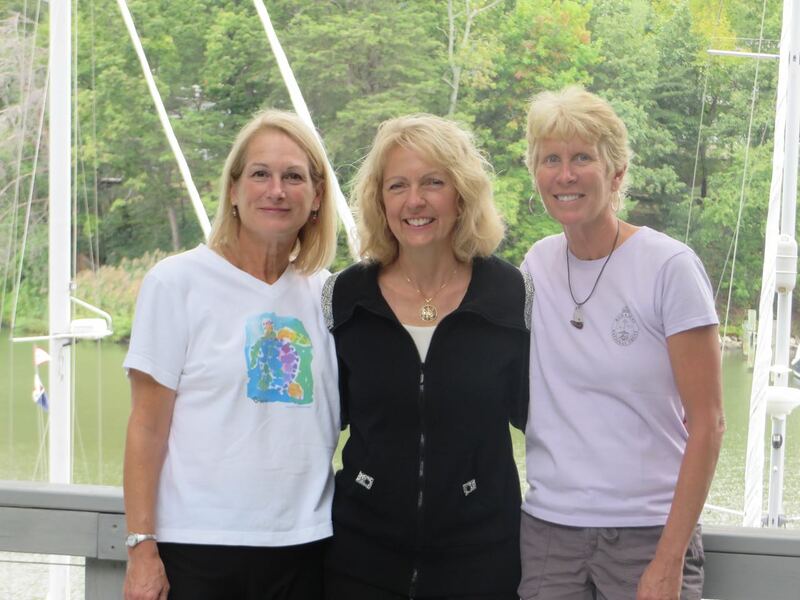 There is also a special welcome party hosted by the “Rose Buddies” when there are 5 or more boats at the dock. They give a red rose to each boat. I told my captain that he now owes me a red rose since I missed this. This was a long blog, but because it was a new experience I really wanted to remember it all. I read somewhere that the Dismal Swamp Canal route is one of those “either you love or you hate it” experiences. I don’t think it is that black and white for us. We are really glad we had the opportunity to take this route, everyone should do it once. Will we do it again when we go north in the spring?? Undecided. Here we are again, two years later, waiting out wind and rains in Hampton. Coincidence? 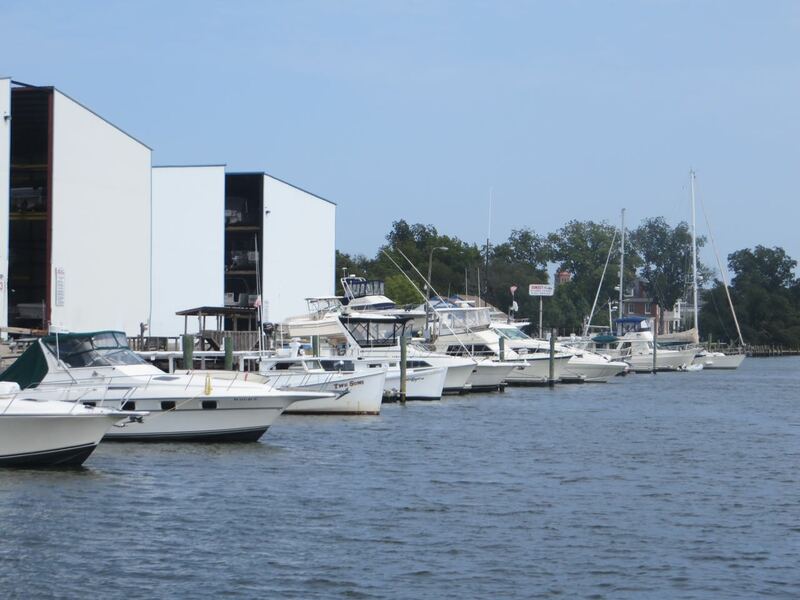 This time instead of the Hampton Town Piers, we are at Sunset Creek Boating Center. Even in the rain, they move boats around. Sunset Creek Boating Center – small boats are stored on those racks in several buildings and moved with a fork lift. Almost looks like it is flying in the air. SailFlow is an app on my phone that we use to check the winds. This is Sunday morning and it is calmed down from yesterday, at least near us, the blue dot. Red and purple colors are NOT good. I am not fond of orange either. Give me the light blues and greens only. What do you do in the rain? On our last visit in October 2013 (Rainy Days in Hampton) we did a lot of the tourist things with a “Sea to Stars” pass that included a 3-hour boat tour to Norfolk and a visit to the Air and Space Museum. To stretch our legs after 2 days of traveling the water, we walked the mile into Hampton to get ice cream at the Old Hampton Ice Cream parlor. What’s this??? — “Will be back at noon” said the sign on the door. I have to admit we were there for ice cream before noon, but it was after 11:30 am. It’s ice cream time somewhere, right? Ok, let’s just walk about for a little while. 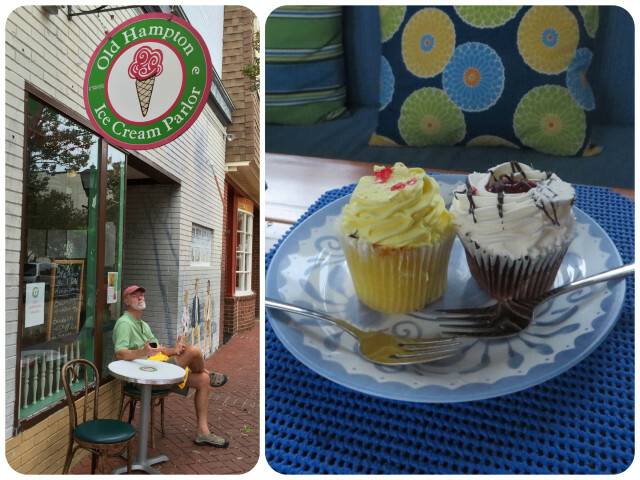 Hampton is pretty quiet without much to do other than the museum. 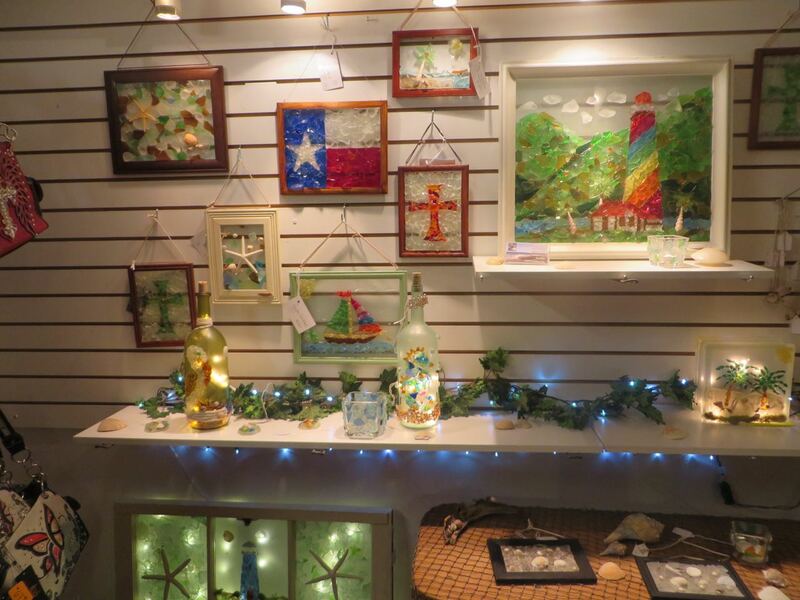 A display of sea glass art in a little shop. I’m not sure about the authenticity of some of those colors! 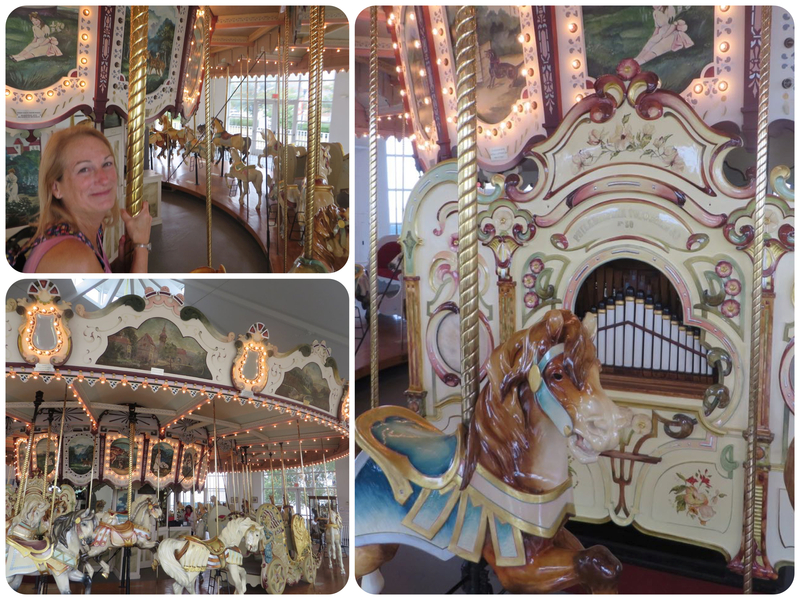 We continued down to the waterfront near the Air and Space Museum to see if the old carousel might still be open. 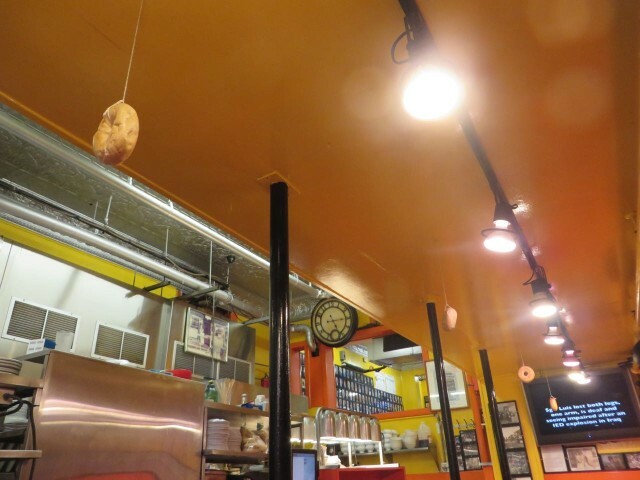 Hurrah — It was open! Last time it had already closed for the season. Yeah, something new to do!! So glad there was no height maximum. We were the only people there, and for a dollar each, we got to ride. This carousel was built in 1920 by the Philadelphia Toboggan company. The horses were carved from hardwoods by Italian, German and Russian immigrant artisans. The carousel was located and operated at the Buckroe Beach Amusement Park from 1921-1985. The City of Hampton purchased it in 1991 and had it restored by R&F Designs of Bristol, CT (wow – two geographical connections to me, Philly and CT.) It is now one of less than 70 antique operating carousels still remaining in the US. 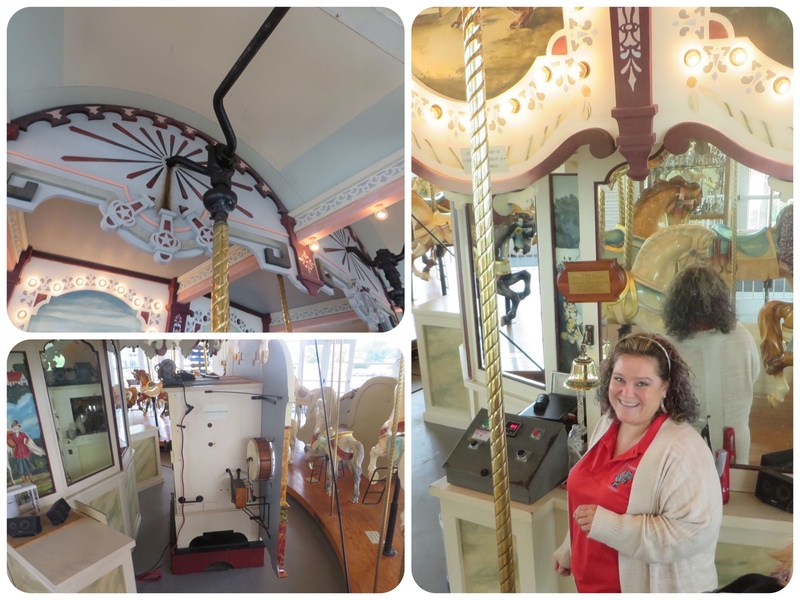 How the carousel works and the charming lady who gave us our ride. Round and round we go to the tune of the old organ music. It was the highlight of my day. And maybe the visit! A stroll back to the ice cream parlor around 12:15. Still not open. We waited patiently until 12:25 pm. Poor Al, so sad sitting under the sign that promises ice cream and did not deliver. We bought these cupcakes at a bakery as a consolation treat. Not as good as ice cream. Saturday was rain, rain, and more rain, with gusty winds thrown in for extra fun. it wasn’t too bad here at the dock, tucked into Sunset Creek. We never left the boat all day. What did we do??? The electricity and free wifi at the dock helped us to pass the time. Al did boat chores, of course. He always finds something to fix or maintain – changed the oil in the engine, changed the fuel filter, fixed the gimbal on the oven, cleaned out the hose from the toilet to the tank, added a doohickey to keep the trash bin from opening in rough seas. The trash can “doohickey” for rough seas: Left – Insert the red cord through the hold so that the black knob gets caught there. 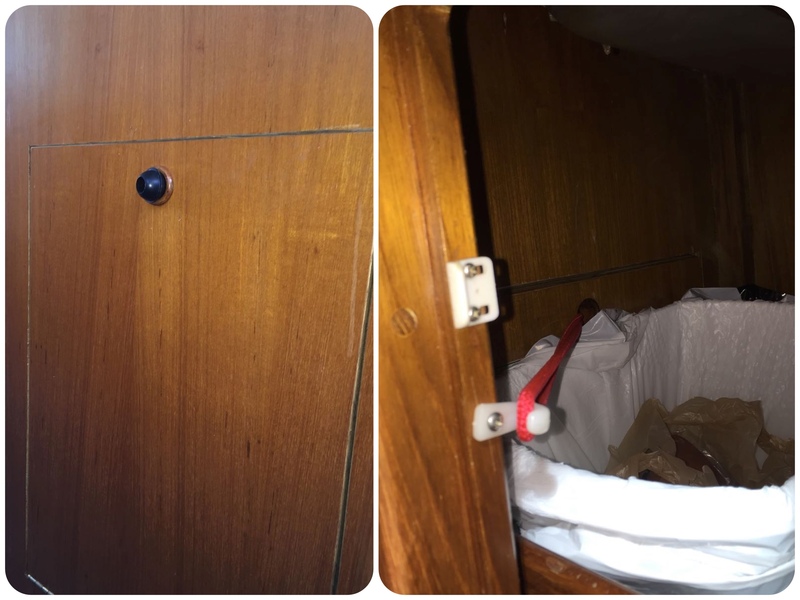 Right – Then reach in and loop the cord around the white hook that he installed on the inside of the cabinet door below the sink. Got that? Me, I sometimes take photos or edit them and work on the blog, but mostly I do my boat chores which are not nearly as interesting as Al’s – just cooking, cleaning, organizing and keeping records. And I read. 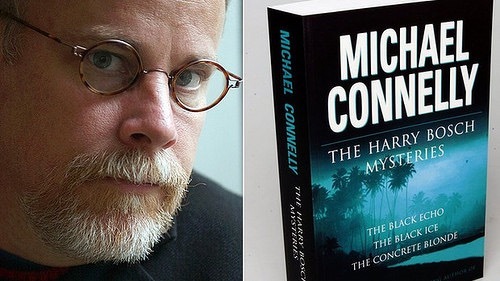 I am on a “Bosch binge” right now, reading as many of Michael Connelly’s Heironymous Bosch detective novels as I can. How nice that I can download books from my hometown library onto my Nook while traveling! There is also naptime! A key component of cruising, especially after several long travel days in a row. When it is raining, you have to take a nap. 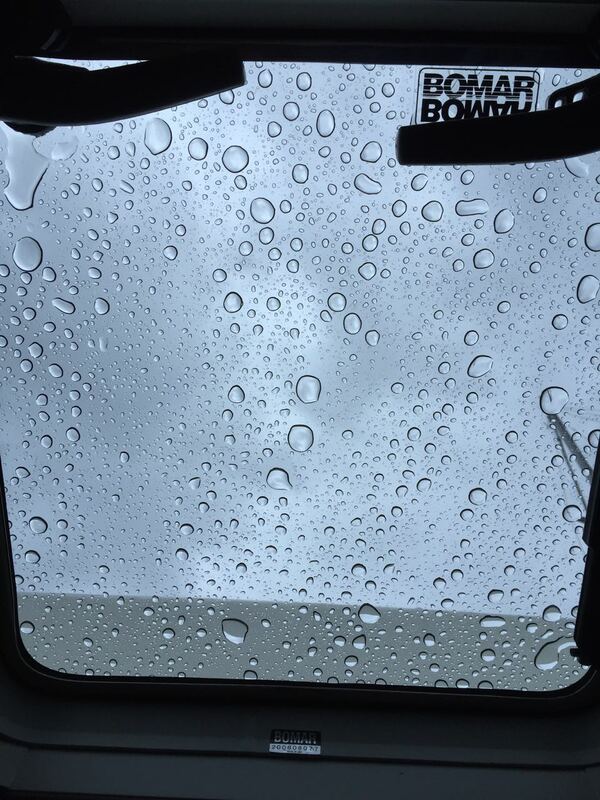 To the right is the view above our heads while we nap – lots of rain drops! Later in the day, we needed to get off the boat so we had dinner, such as it was, at the Barking Dog, a little restaurant right in the parking lot of Sunset Creek. We had dogs, of course. 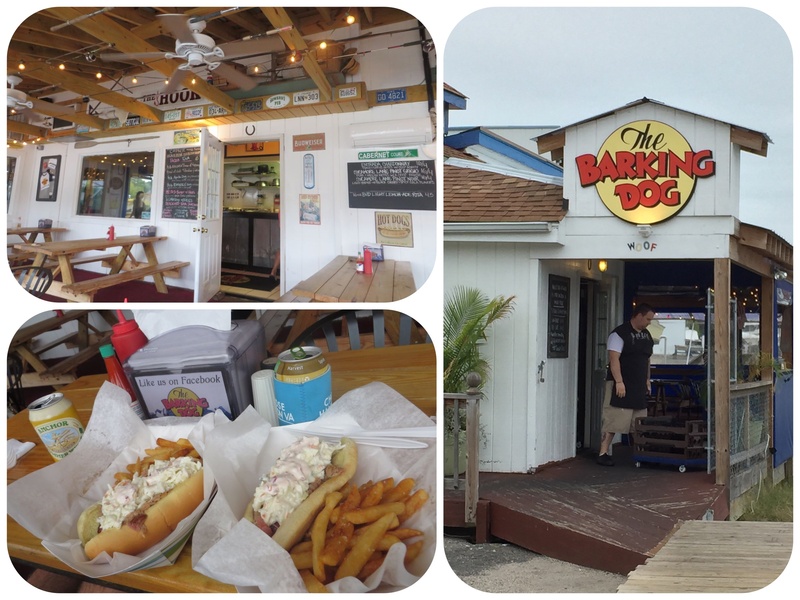 The Barking Dog – inside and outside. Our Carolina Hot Dogs were pretty good, covered in barbecue, and cole slaw. Sunday was surprisingly brighter, although still quite windy. 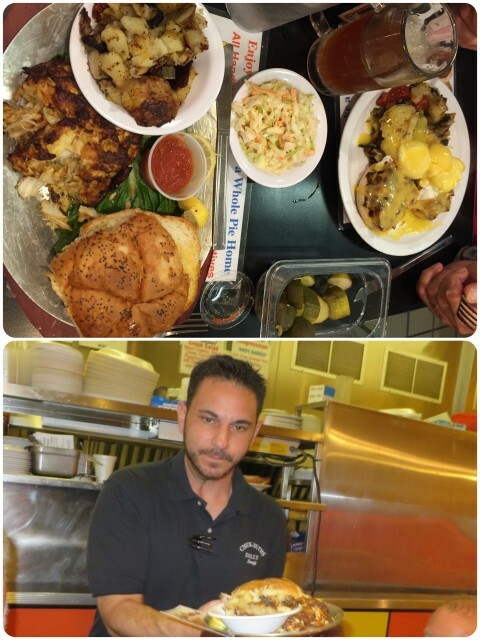 It looks like all we do is eat, but we just had to have Chesapeake crab cakes again. 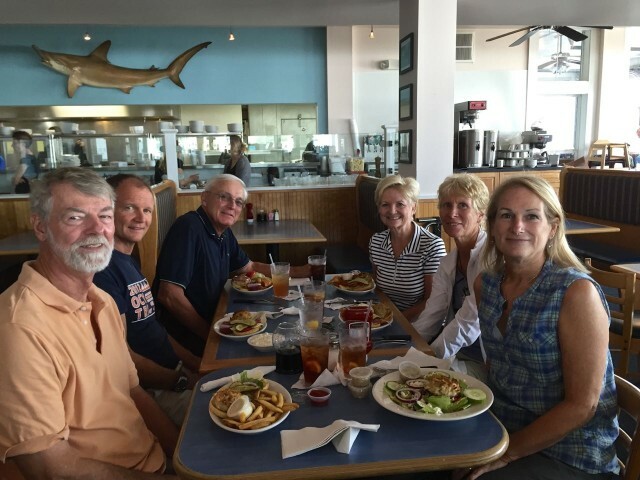 Lunch at the Surfrider Restaurant with the Crouch clan – Dan and Marcia and Dan’s sister Beth and husband Rich. Delicious crab cakes again!! 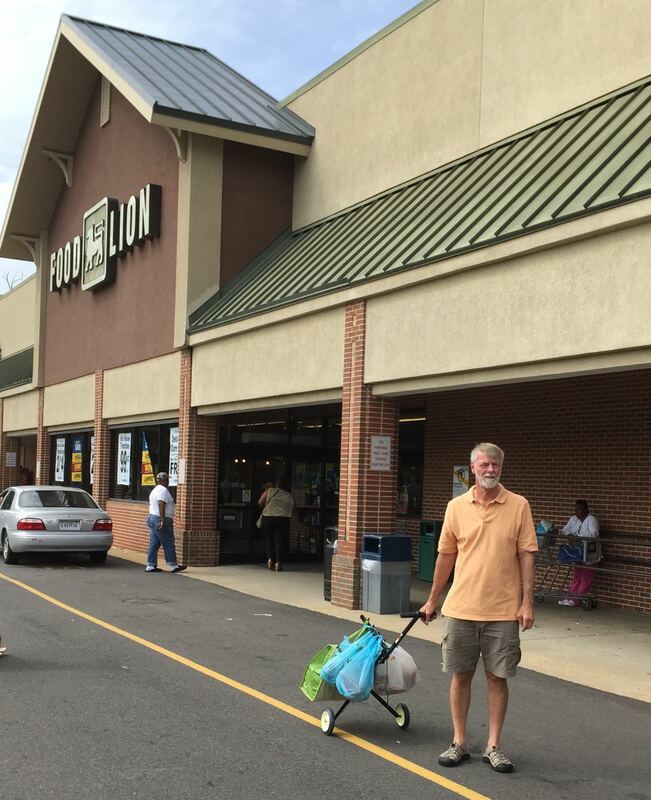 After lunch, we walked some of it off by making a stop at the grocery store for fresh provisions. 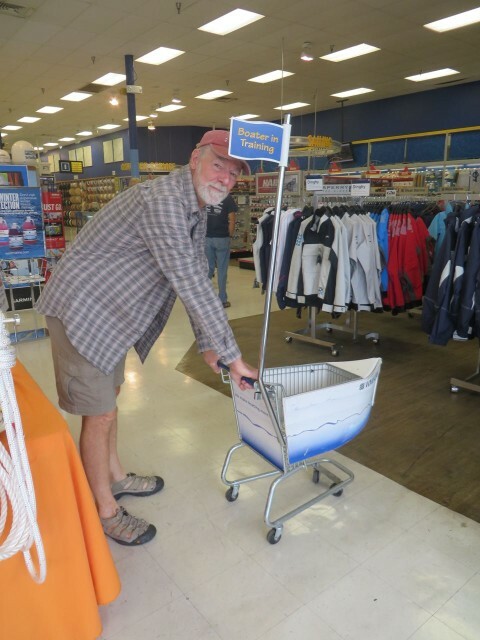 We tried out our new “Hook and Go portable folding supermarket shopping cart.” Grocery bags hang on the hooks Easy to store It worked very well. Al with the loaded Hook and Go shopping cart. 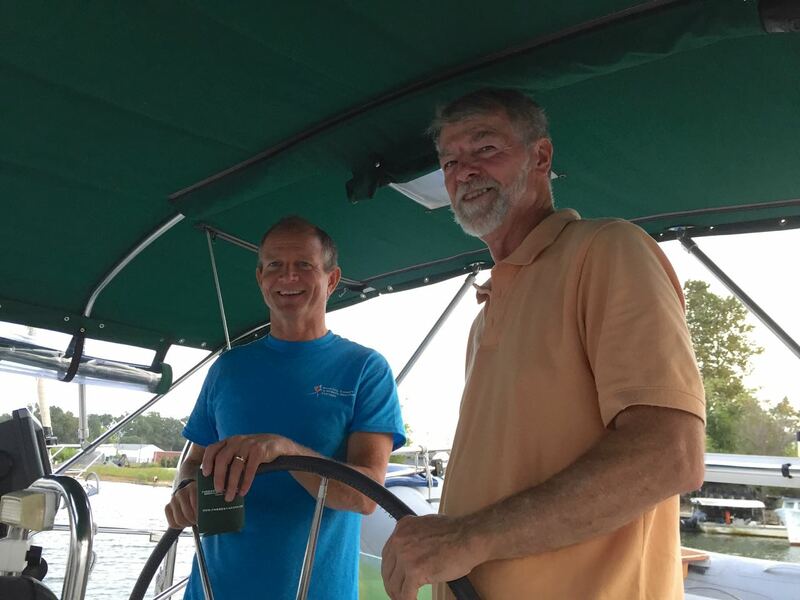 The Captains confer together again, working on the Garmin chart plotter/Homeport software strategies. We are all sure that the designer(s) who create and code the software have a twisted side. They also don’t believe in anything that is “intuitive.” But that doesn’t deter our guys! 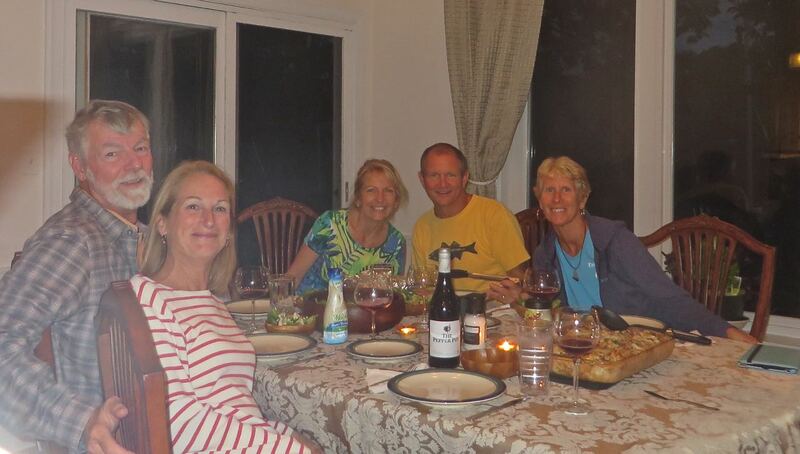 They are still smiling after working with those Garmin gremlins. All set and ready to roll in the morning. 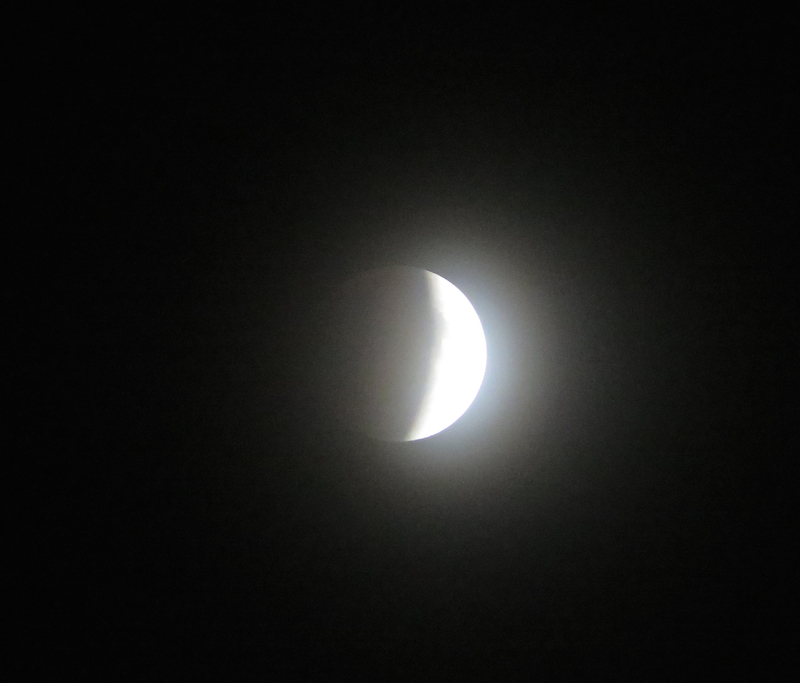 The big event for tonight is a rare blood moon total lunar eclipse. That’s a mouthful. It’s a special moon event – not only will there be an eclipse, but the moon will also be about 14 percent bigger and 30 percent brighter than usual,making it a “supermoon.” We actually stayed up past our cruiser bed time to try and photograph it. But with the cloud cover from the recent storms, it wasn’t meant to be. 🙁 Guess we will have to wait until the next one in 2033. This was before the eclipse began. 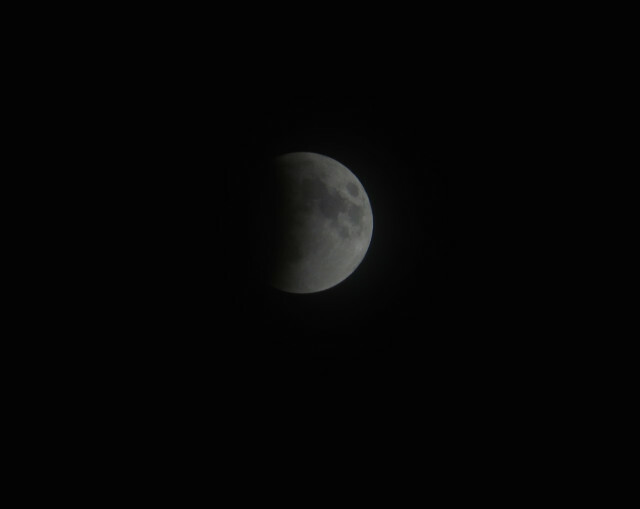 This was about 9:45 pm when there was a tiny break in the clouds. On Saturday, September 19th, we made another early morning departure (early = pre-sunrise) from Cape May so that we could make it all the way up the Delaware Bay and into the Chesapeake-Delaware Canal to Chesapeake City. 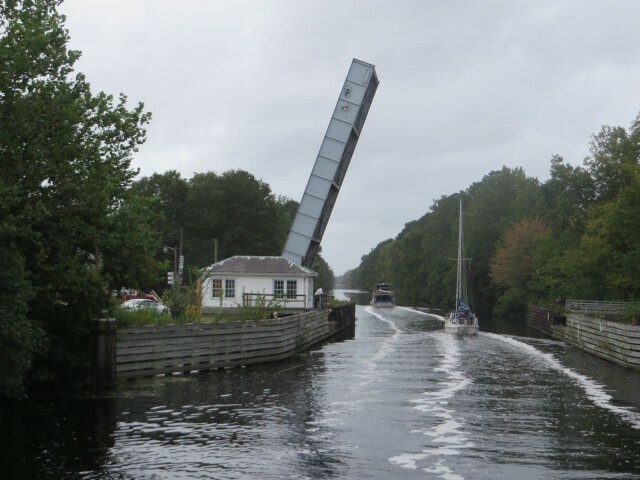 Now that we no longer have that very tall mast, we can take advantage of the Cape May Canal and fit under the canal’s bridge. Aiming for the lights on the bridge at the beginning of the canal. The lights reflecting from the old narrow swing bridge look nice in the light morning mist. 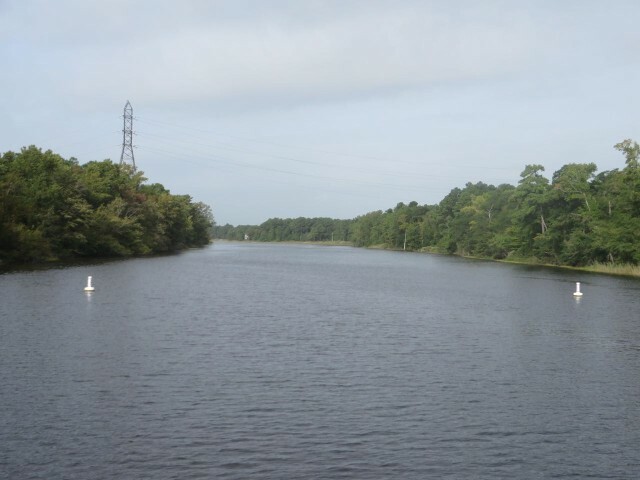 The banks of the Cape May Canal in the morning. The ferries are still sitting in their docks at this hour. 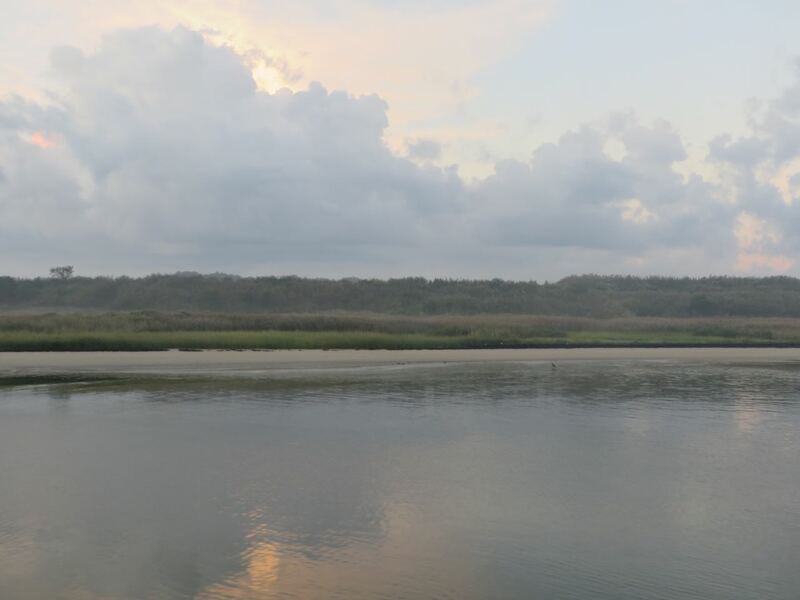 The trip up the Delaware Bay was long and tedious, but problem-free. We had the current with us for most of the way until we turned into the C&D Canal. 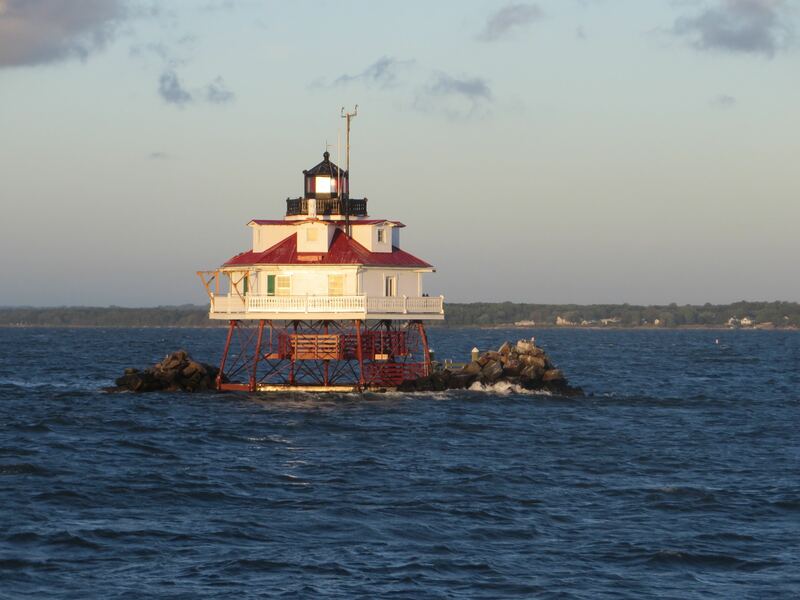 Ship John Shoal Light was the only thing worthy of a photo in Delaware Bay this time. We entered the Chesapeake & Delaware Canal in the sunshine. Because it was also a Saturday the crazy power cruisers and cigarette boats were out in full force! 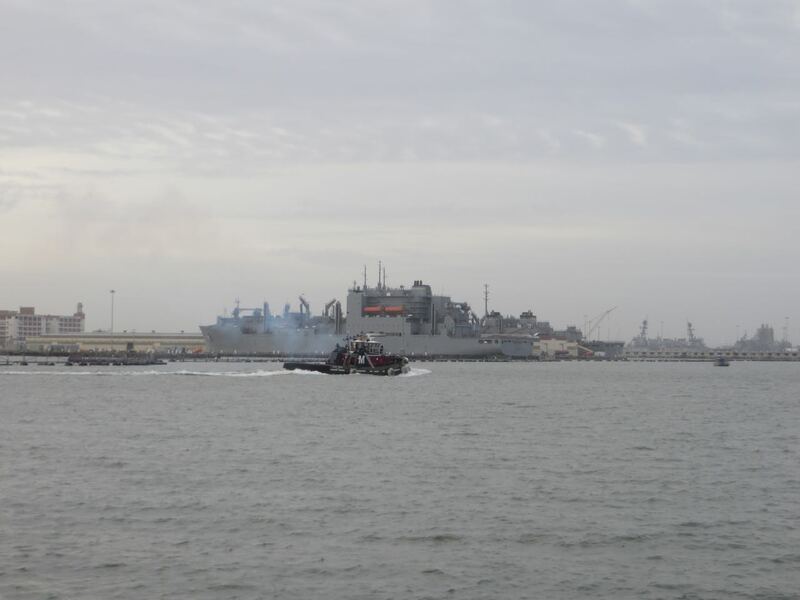 Many were headed to Chesapeake City for lunch and dinner. By the time we arrived it was quite the busy place, so we maneuvered into the anchorage at the back of the little harbor. It was certainly more crowded than either of our two previous stops here. 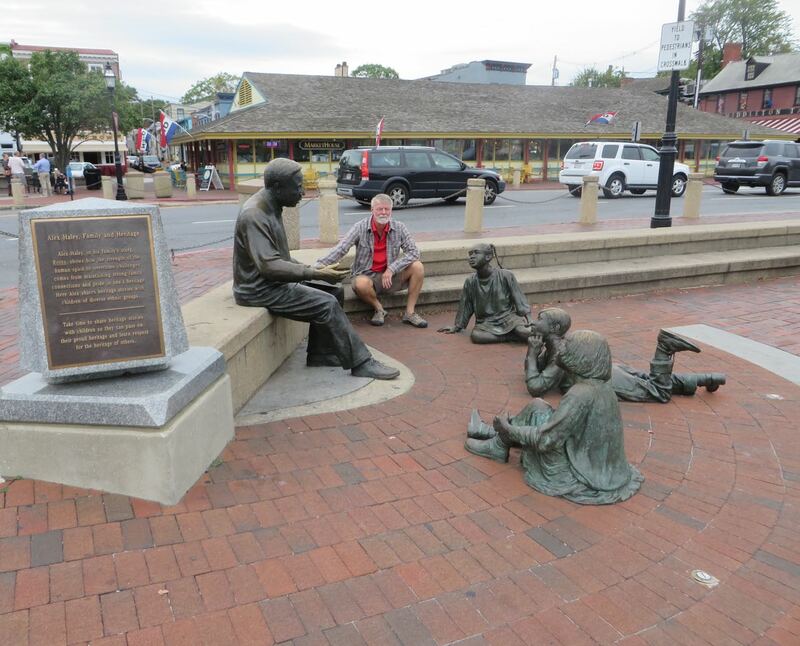 After our 9-hour trip from Cape May we were ready to just sit. Found a spot in the back before all of the other southbound cruisers arrived. 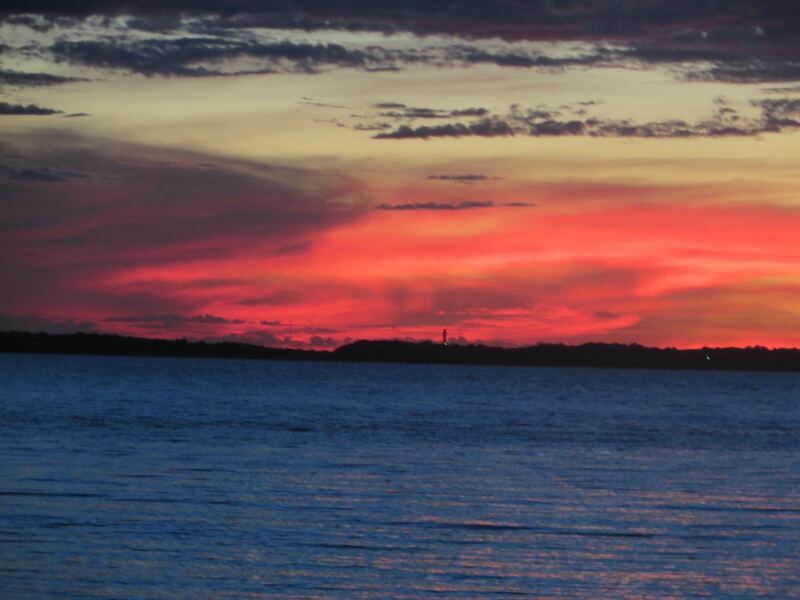 Notice the old sailboat on the left? He was anchored near us in Cape May. That boat has seen some miles. 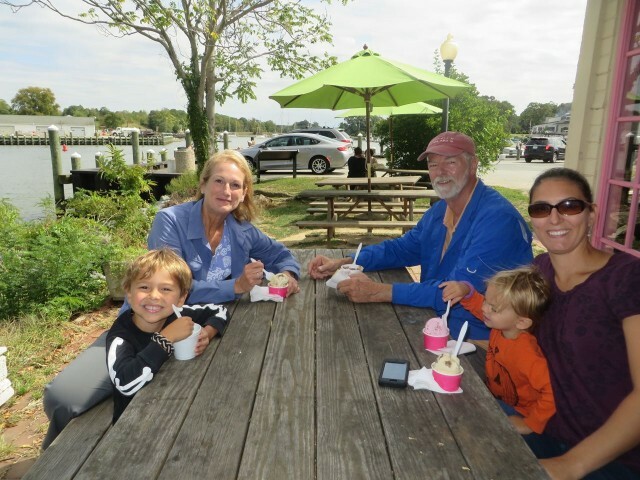 We stop and stay overnight in Chesapeake City so that we can visit with our daughter Alicia and grandchildren, Aaron and Ella. The visit included lunch, a dinghy ride, and ice cream. ~Aaron and Ella on the flybridge with Papa. 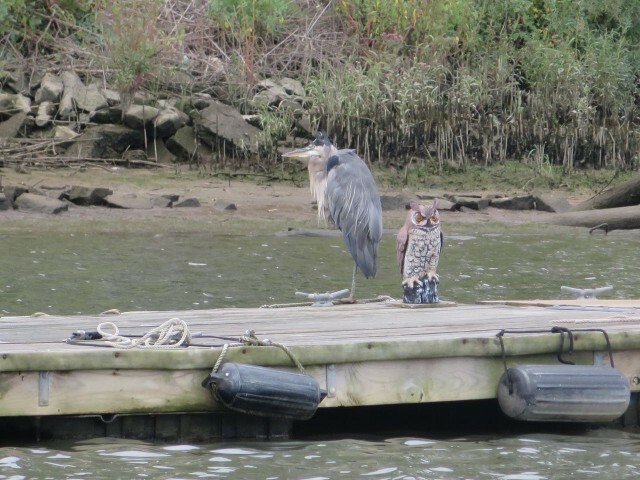 During the dinghy ride around the harbor, we spied this heron sharing the old dock with a fake owl. Enjoying ice cream by the canal. 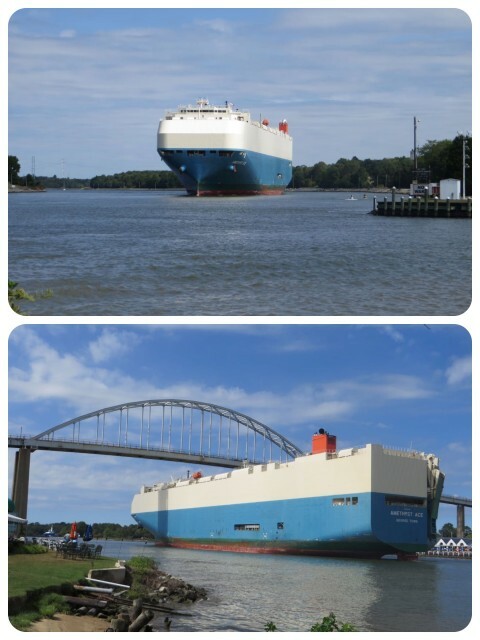 While we lingered over our ice cream, this enormous cargo ship appeared in the canal, dwarfing everything near it. We weren’t sure it was going to fit under the bridge! 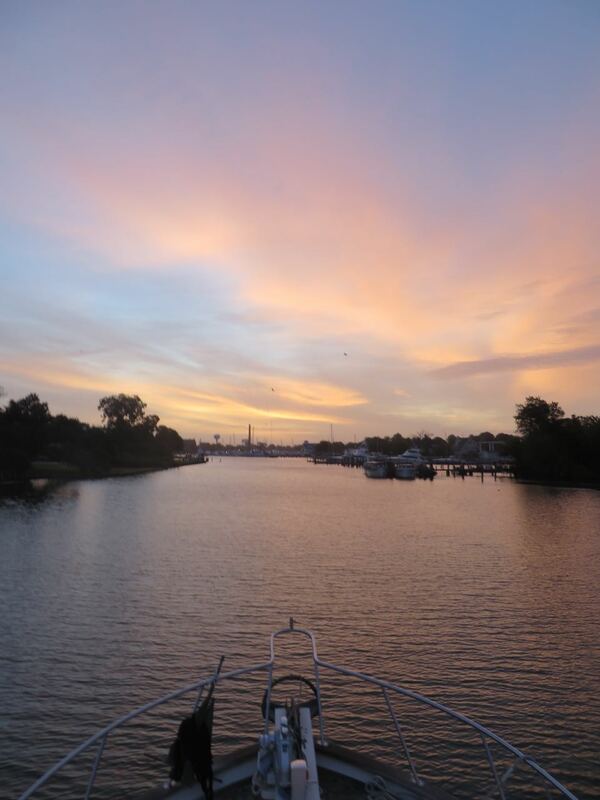 Rather than wait for morning, we pulled up anchor after our family time and began the journey towards the Chesapeake Bay. The bay is approximately 200 miles long from its northern beginning at the Susquehanna River to its southern outlet into the Atlantic Ocean. 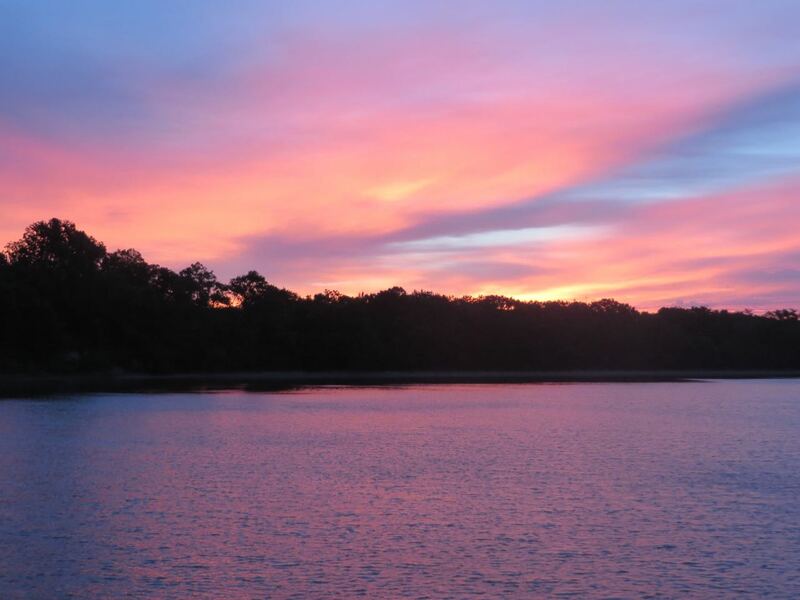 It is 2.8 miles wide at its narrowest and 30 miles at its widest, a very large body of water. When we are charting courses in the Chesapeake we never fail to be amazed (and somewhat confused) by the numerous rivers, creeks, and small bays. 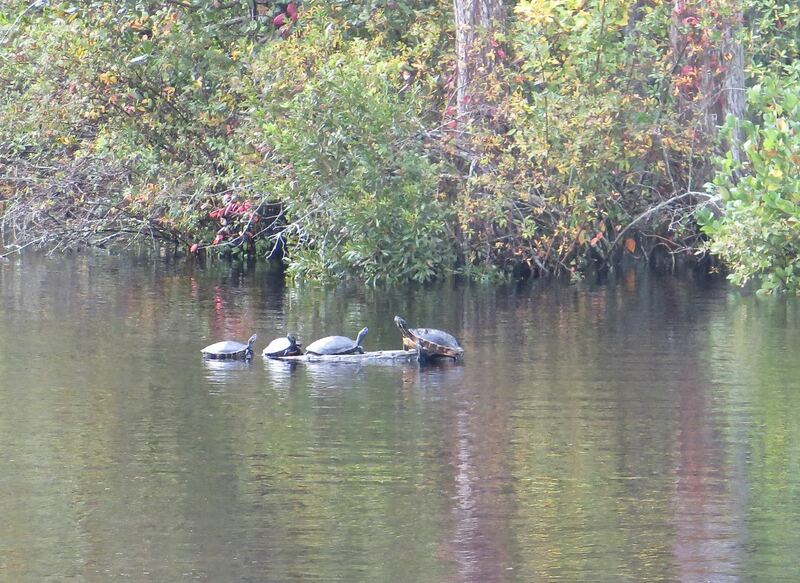 I think half of them may be named “Back Creek” and they all look the same on the chart to us at first glance. 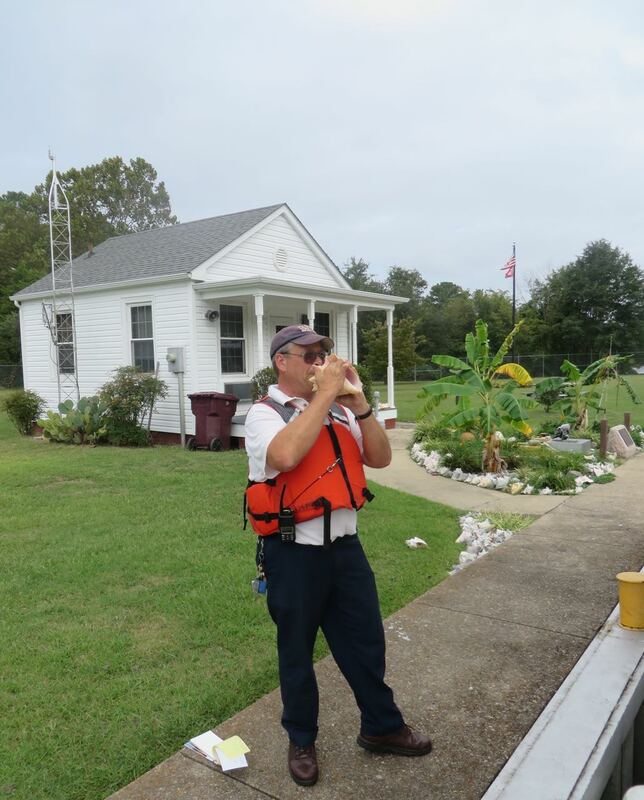 When planning a route into a river or creek, you really have to study the chart closely and double check the critical features. On the left is a wide view of the bay. 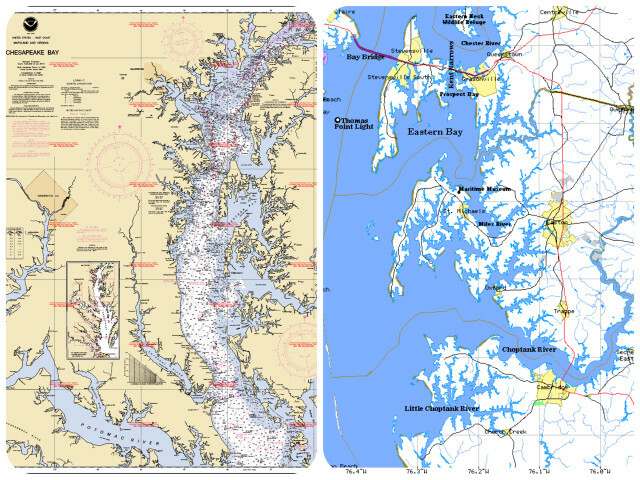 On the right is somewhat closer view of the eastern shore around Kent Island (where we boat this boat) and the Choptank River. Either one shows how many little “ins and outs” there are. Chesapeake boaters have so many places to explore! 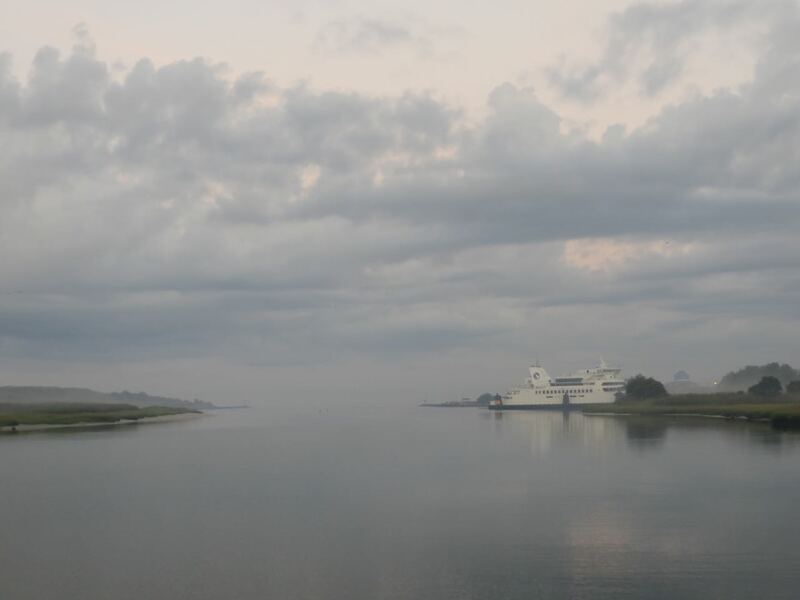 Worton Creek was a beautiful and peaceful (especially after Chesapeake City) anchorage for our evening and overnight resting spot. 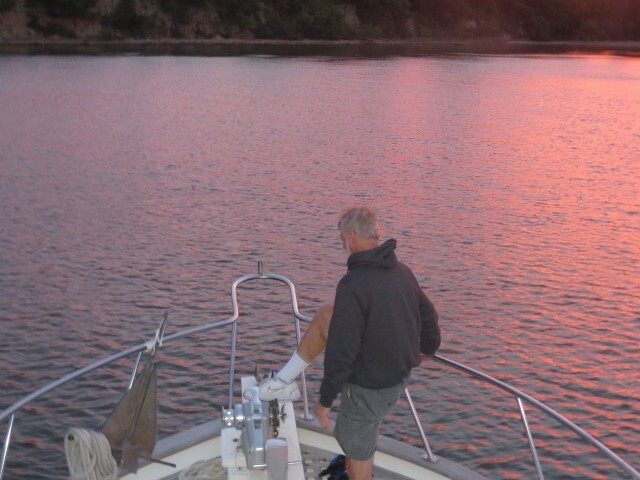 Al pulls up the anchor for another early start. 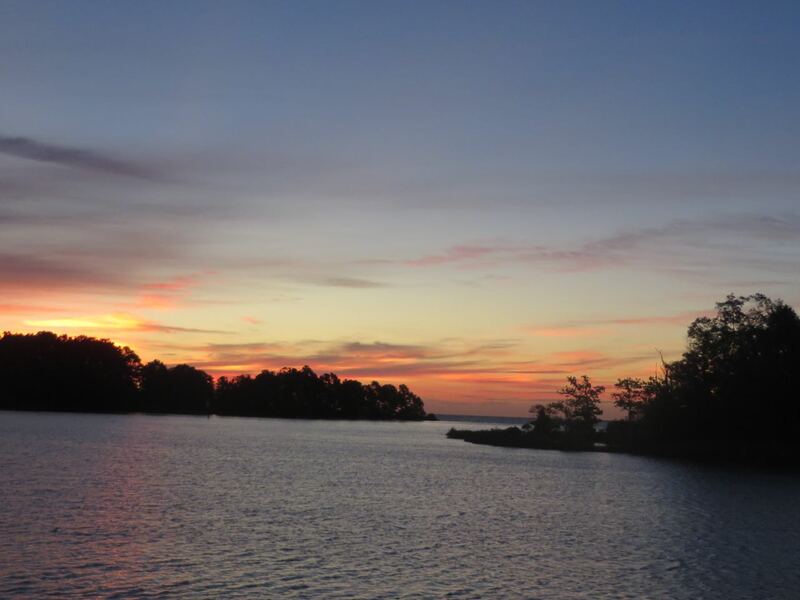 We are already losing count of the beautiful sunrises that have greeted us so far. Simply stunning. This giant balloon-like device, the size of a football field, keeps watch over the nation’s capital and a huge swath of the eastern seaboard. 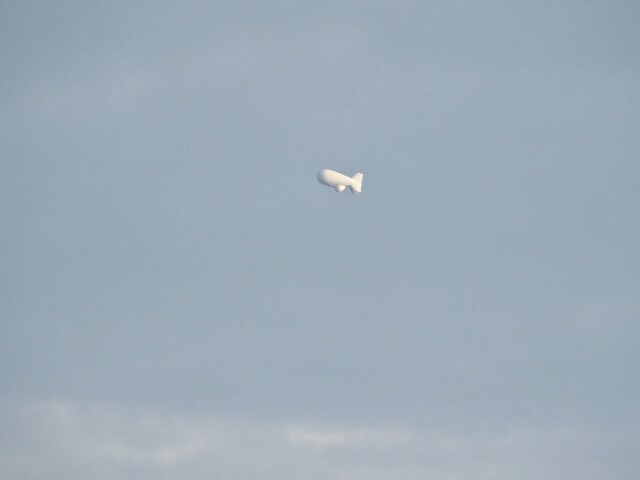 A search on Google informed us that this is a military surveillance “blimp”, JLENS, short for Joint Land Attack Cruise Missile Defense Elevated Netted Sensor, that floats at an altitude of 10,000 feet, 24/7. The radar onboard allows the military to monitor spots where the United States has “potential security gaps.” The two blimps are tethered and have no cameras or weapons. Is this awesome or what?? There is Kindred Spirit next to Eleanor Q, and Cutting Class on the other dock. Captains Al and Dan are waving from the dock. Ems made us a lovely welcome dinner on our first evening. This marina will get high marks on its survey. 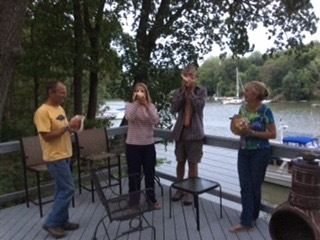 At sunset we blew our conch horns out on the deck. This West Marine had the cutest little shopping carts – “Boater in Training.” Think Al might be beyond the training phase? We need a new VHF radio for the bridge. Al gets advice from Will Heyer, a Hope Town friend who lives in Annapolis in the winter. Great fun to see Will and Muffin again! 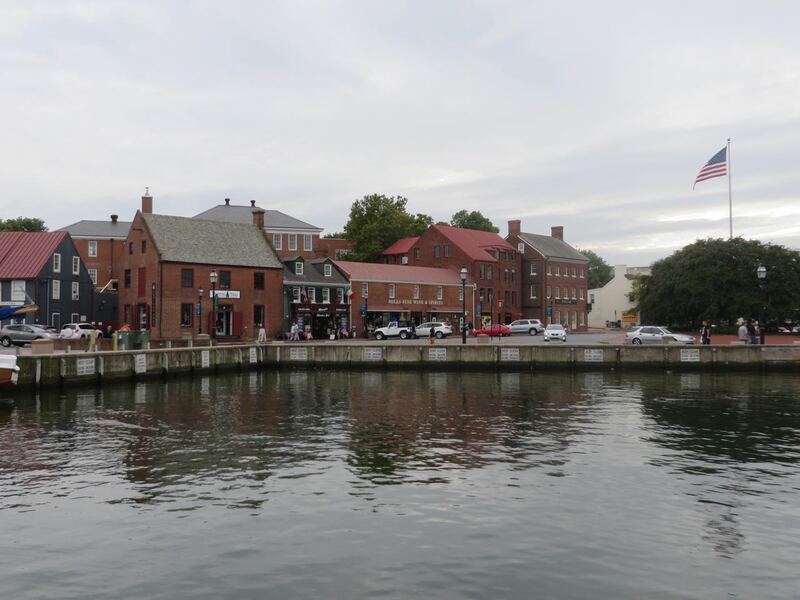 Later in the afternoon we took a walk around Main Street in Annapolis. 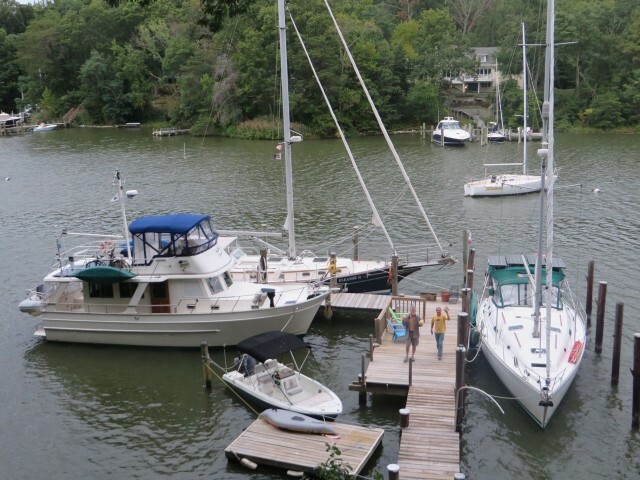 The dinghy docks in downtown Annapolis. Al sits down with the children and Alex Haley to listen to a story. Maryland = Crabs. They taste better here than anywhere else. We decided to have dinner at Chick and Ruth’s Delly on Main Street, a local diner with lots of quirks and food. As we waited for our meals, I asked our waiter about the bagels hanging on strings from the ceiling. It’s a fun story and I don’t think I should spoil it for anyone else. Should I? Read this next picture ONLY if you want to know the story behind the hanging bagels!! 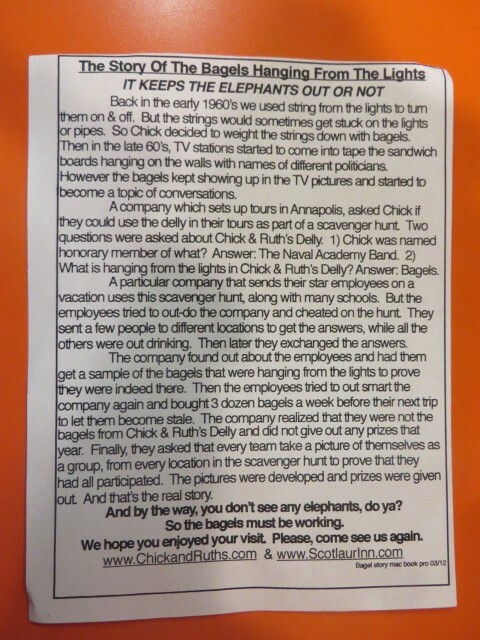 The story of the bagels on the strings. No elephants! Our “dinners” – I had a giant crab cake, but Al, Dan and Marcia got the Crab Eggs Benedict, breakfast for dinner. With beer………… It was all delicious. Rob, our waiter, was the best. Deadpan funny. 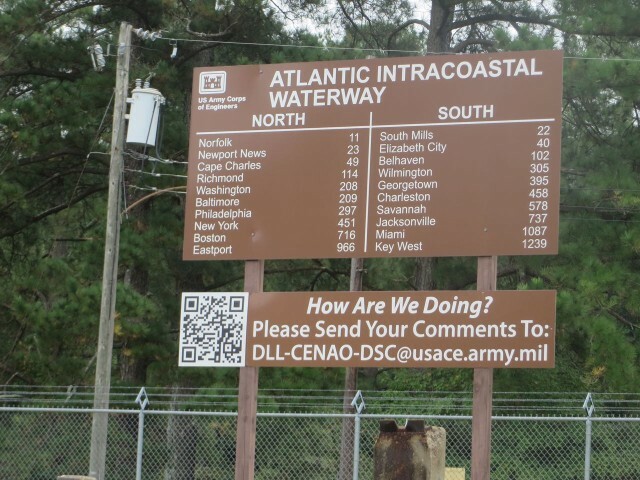 We departed, early again (there’s a pattern to this trip – we are 2 weeks ahead of the schedule from the 2013-2014 adventure) so that we could get to Hampton, VA. 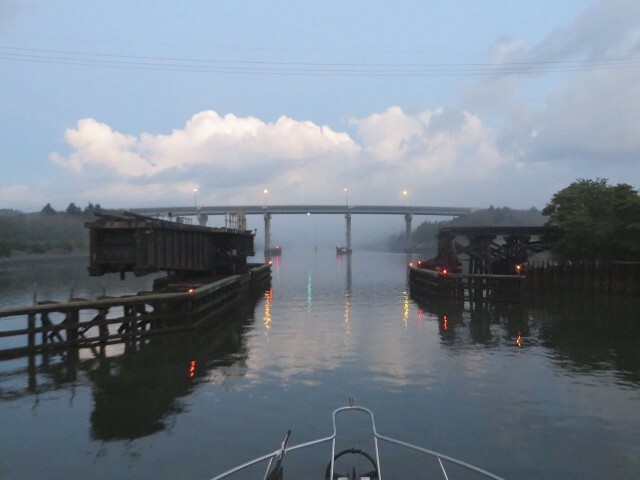 The first day was 10.5 hours long down to Reedville. We spoke on the VHF with Mark on Spirit and Ben on Loon, both folks we had met in Hope Town in 2013-2014, also heading back there for the winter. 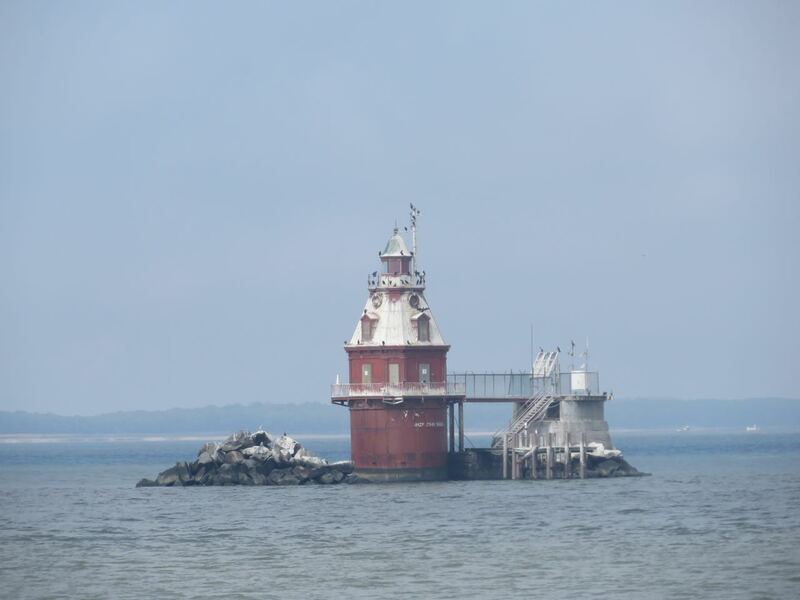 The Chesapeake Bay was truly a place for reconnecting. 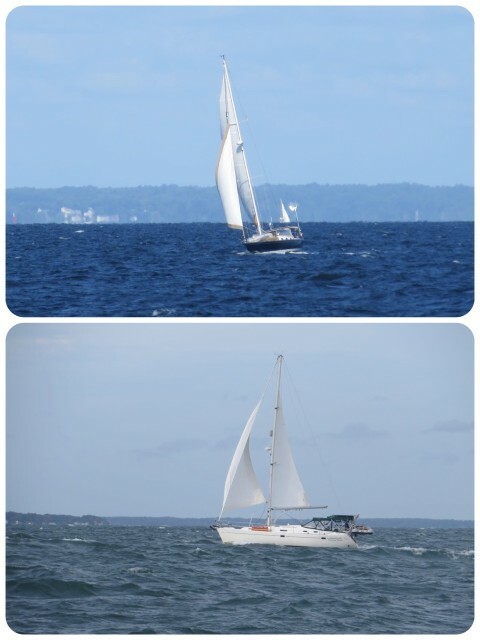 Spirit and Cutting Class sailing along with the northeast winds. This was one of those days when we really missed the Morgan. She would have performed nicely and loved these conditions. Thomas Light always deserves a photo. 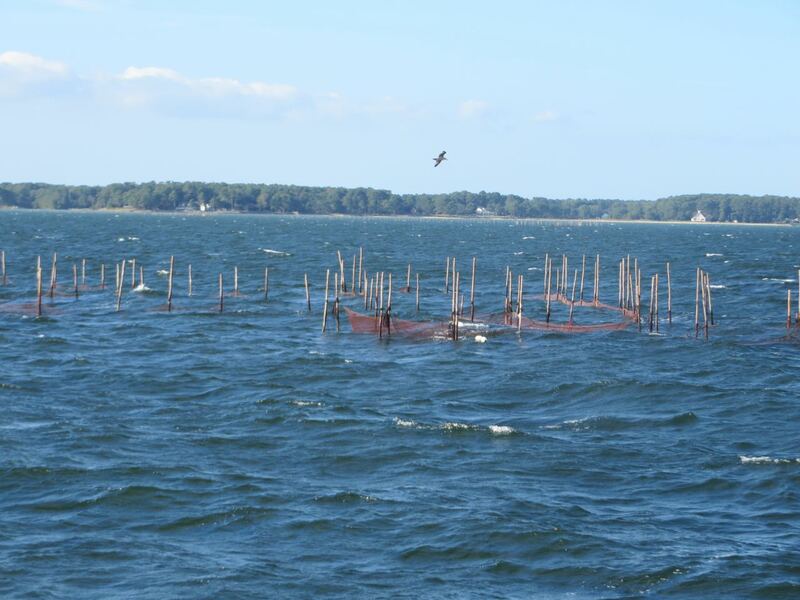 Have to keep a watch for the fish traps marked by their poles. We anchored in Mill Creek not far from Reedville, and were now in Virginia, the lower Chesapeake Bat region. ANOTHER early morning departure!! Leaving Mill Creek as the sky lights. The second day of our journey to Hampton, Virginia was a rough day. The winds were stronger and the waves were around 6-7 feet, giving us a washing machine ride, rocking and rolling. 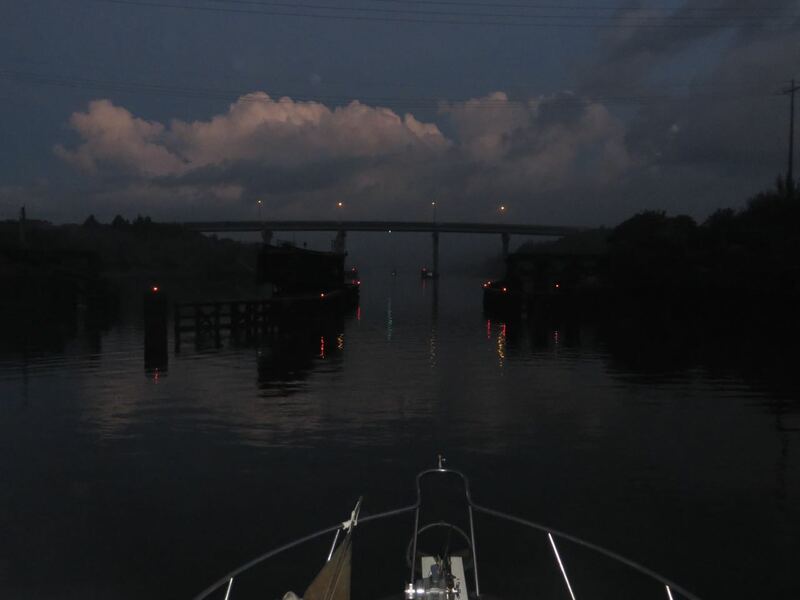 After 8 hours of it, we pulled into a dock at Sunset Creek Boating Center. 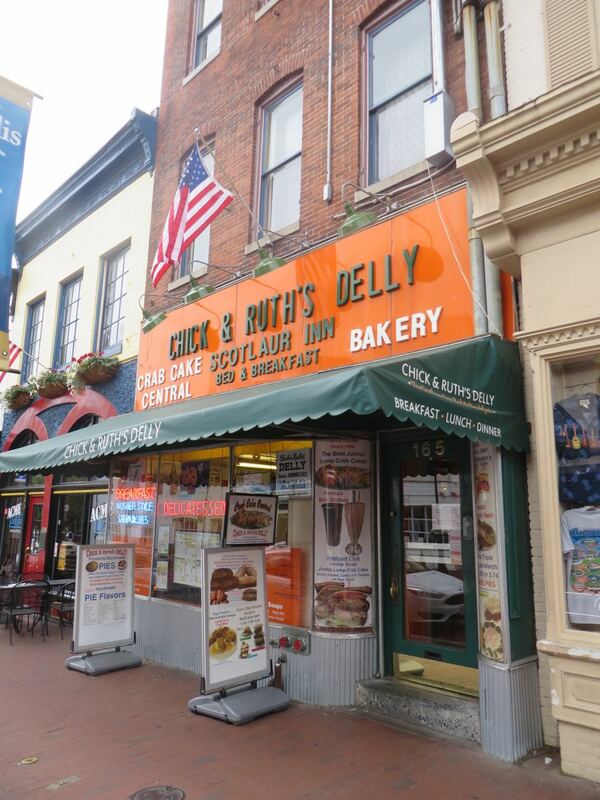 Not a picturesque place, but friendly and inexpensive. And a very safe place to wait out the storm that is coming. 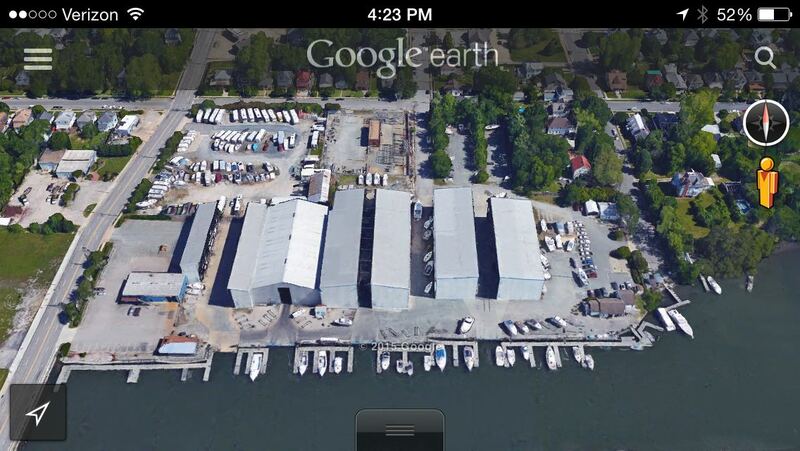 A Google Earth view of the Sunset Creek Boating Center. 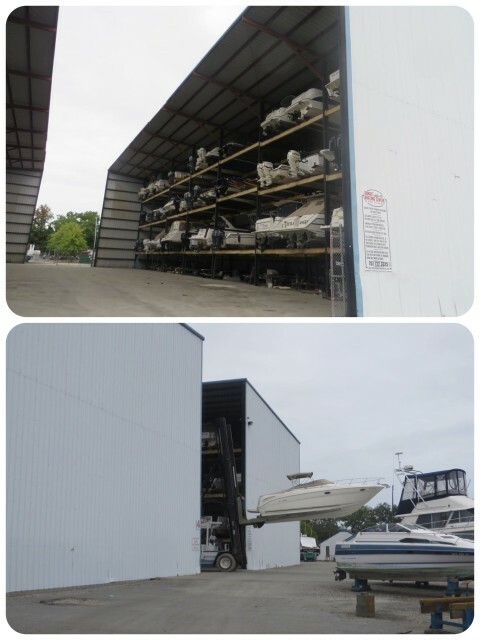 Smaller boats are stored in the huge gray buildings and are moved on big forklifts when someone wants to use them. We only had a peek at the Chesapeake on the trip, but here we are on Friday, September 25th, sitting safely, for the next 3 days of rain and winds.